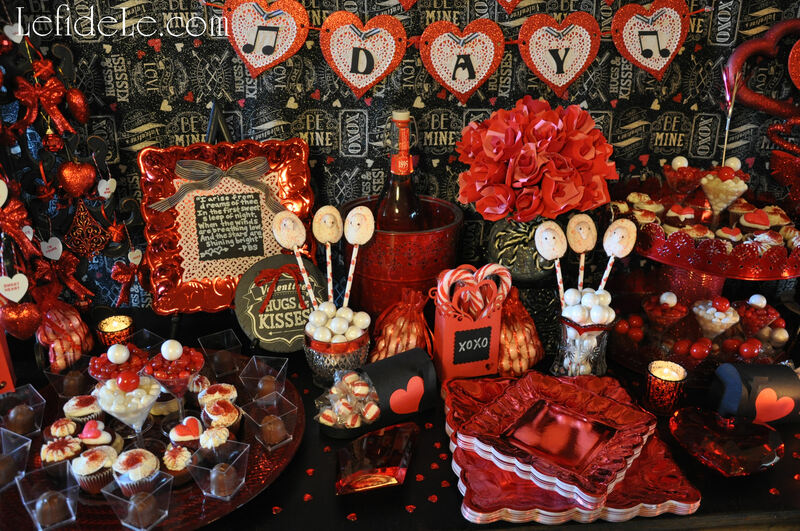 This love letter themed tablescape make’s the perfect setting for Valentine’s Day, a romantic date night, or even an anniversary dinner. I find that in the modern era of effortless texting, emails, and social networking, that it can be a lovely quixotic gesture to turn back to the sentimentality of a handwritten letter on actual paper. Then to go further back to capture the romanticism of script, drafted with pen and ink well on paper that’s been sealed with wax… so that none other than the intended may lay eyes on the heartfelt content. Call me old fashioned if you will… I’ll just take it as a compliment. Verse spells its way across a love letter inspired cloth is laid upon a greater midnight black tablecloth. Six ravishing red roses rise from a vase overflowing with soft petals. A boundless array of them blankets the table. Luminous brass sextuplet candlesticks cast a romantic golden glow over the tablescape. Beneath them lies a once live rose plated in brilliant 14 karat gold. Gilded studs enhance burgundy pillar candles set upon stacked vintage candlesticks that playfully generate light and shadow in the background. Encircling tuxedo black napkins are love letter symbolizing napkin rings trimmed with faux wax seals. Golden utensils bearing wooden handles represent the pens of yesteryear. Waiting to be filled are vintage ruby glasses trimmed with rings of gold that are flanked by golden flecked midcentury champagne vessels. Beneath a resplendent tree sit black ladder-backed chairs cushioned with sumptuous garnet pillows. Italian countryside plates from Mikasa are topped by red dishes resembling wax seals. They obscure all but rings of gold from the gleaming mat chargers below them. P.S. 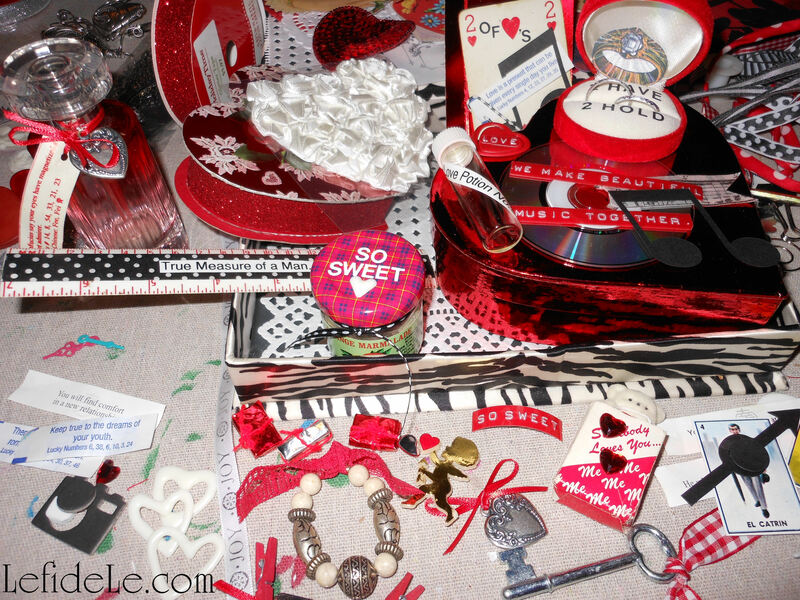 Click here for my Easy DIY Valentine’s Day Countdown Calendar / Treat Bag Banner & Love Letter Napkin Rings Craft Tutorials. 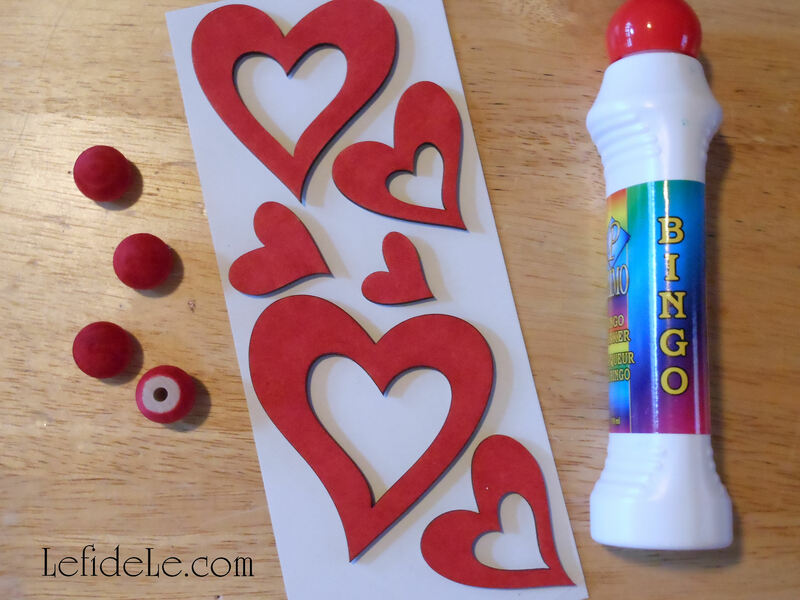 This easy DIY Valentine’s Day countdown calendar plus treat bag banner and love letter napkin rings craft tutorial comprises three of my favorite things to make… banners, napkin rings, and advent calendars. The latter project arose from the questions, “Why are countdown calendars typically made for Christmas advent and not for other holidays?” and, “Why not expand the celebration with 2 weeks of excitement leading up to Valentine’s Day?” This works well for either children or adults depending on what’s placed inside the bags. As for the love letter themed napkin rings, they perfectly fit a romantic Valentine’s theme… though this one is for adults only! 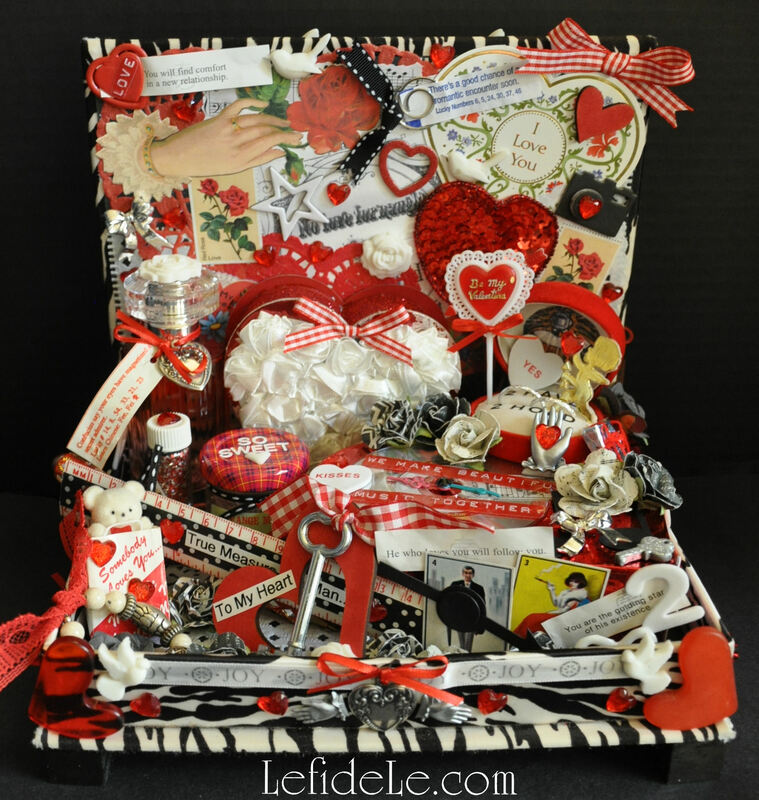 You can make 12 rings and still have enough left over for a gift package bow if you like. You’ll also need either hot glue or liquid fabric glue and fabric paint in red (because it works on so much more than just T-shirts). Measure and cut a 6 inch length of ribbon for each ring you wish to make (use sharp sewing scissors to prevent fraying ends). If using hot glue, bond the ends with one side overlapping the other and press them together tightly. For liquid fabric glue, use a plastic clothes pin as a clamp or secure with a straight pin… and allow them to dry completely. These napkin rings were so quick and easy to craft, and they were a great little touch to add to the Love Letter Themed Tablescape (Perfect for Valentine’s Day, Romantic Date Night, or Anniversary Dinner). If you like, paint the remaining portion of the clothespins in your choice of red or pink… though the natural wood tone would look fine with the paper bags if you’re short on time. 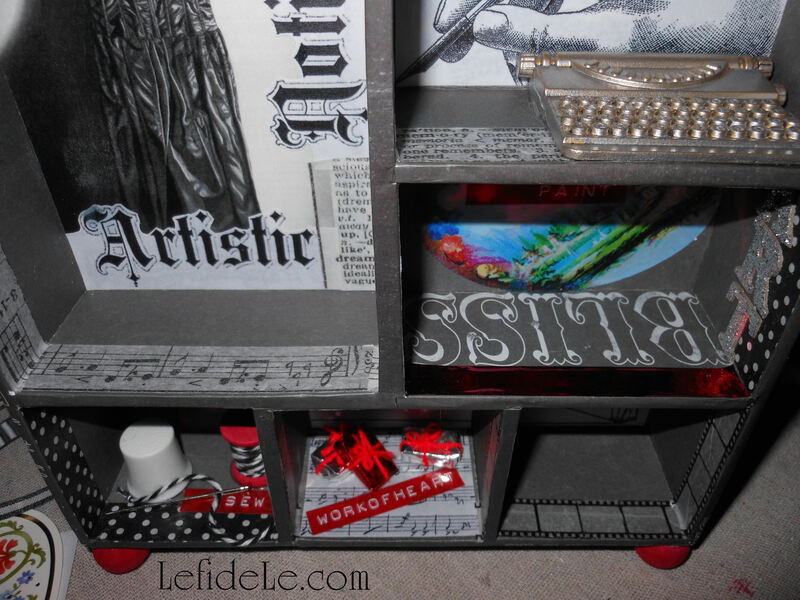 (I used dark scarlet multi-surface acrylic paint from DecoArt, because it matches my spice racks.) It’s easiest to clip them onto cardboard and just paint one side, leaving them to dry before flipping them over and completing the opposite side. You have the option of writing the 14 day numbered countdown with actual chalk (so that they may utilized in another capacity after the holiday) or with a permanent chalk marker that can’t be rubbed off. 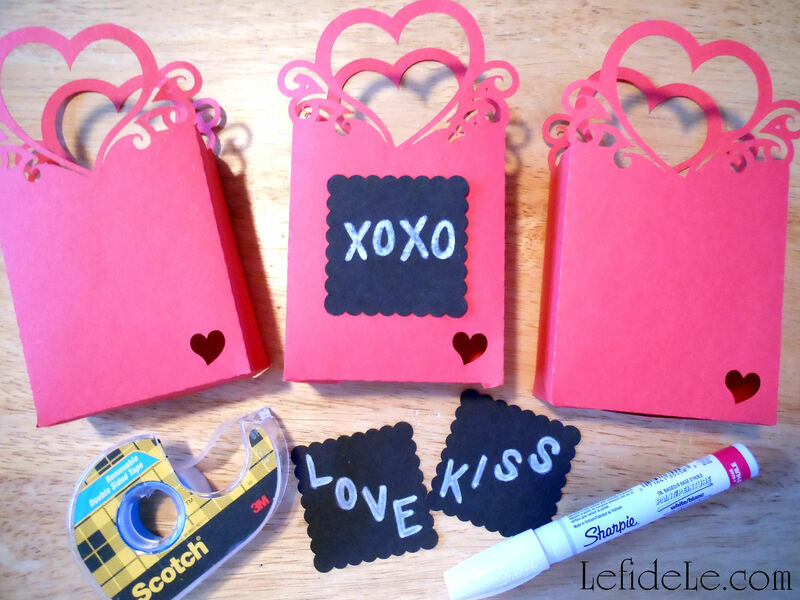 Next, cut out hearts from black chalkboard paper, or use a paper punch in any shape you like, or speedily use readymade chalkboard sticker labels. 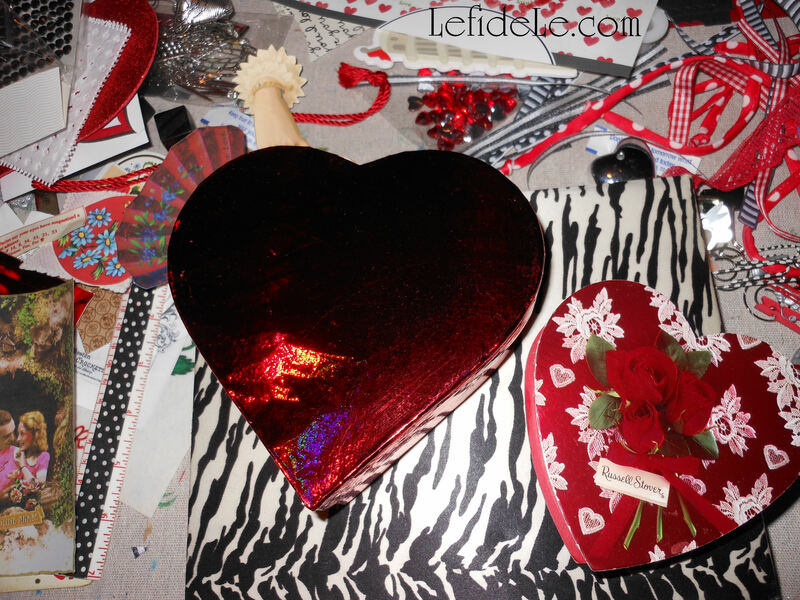 Adhere the paper hearts onto the bags with a permanent glue stick. 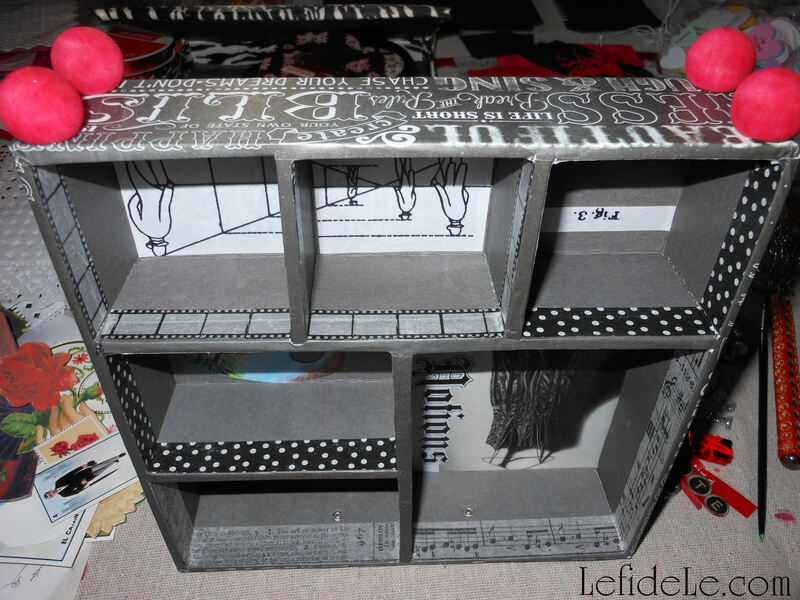 Then run a strip of matching washi tape along the base for easily added flair. String the dry clothespins onto ribbon, string, jute, cording, twine, or yarn. (I used yarn that looks like twine because three times the amount can be purchased for ⅓of the price.) Once again, use either permanent white marker or actual chalk to write on each heart. I chose to write “Be my Valentine!” but “Valentines Day!” or “Happy Hearts Day” would also have fit on the 14 bags. You can also write the names of individual recipients like friends, classmates, or even alternate the names of family members. 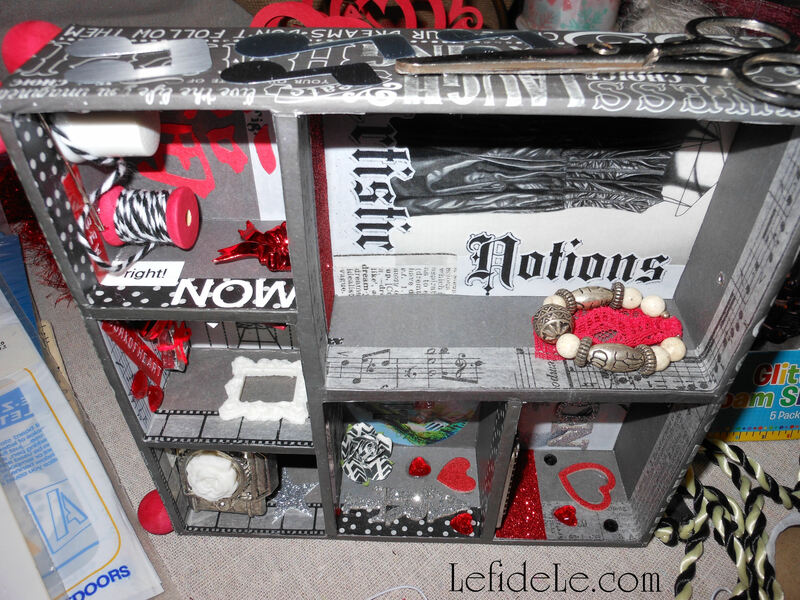 Fill the little bags with anything you like… you can make it as inexpensive or extravagant as you like. For kiddos: try candy, stickers, stamps, tiny toys, erasers, inexpensive jewelry… or silly printed jokes you won’t mind hearing over and over again. On the 14th day, think about directions leading to a larger gift like a stuffed animal. For adults: try printing faux fortunes, poems, romantic quotes, movie or event tickets, or even homemade coupons for “honey-do” chores or special treats. On the 14th day, think about directions leading to a larger gift like a dozen roses, box of chocolates… or something uber masculine like the latest power tool at home depot. This makes a super cute banner decoration as well, and it can be strung just about anywhere using either tape, 2 extra clothespins, or by tying knotted loops at each end of the string. 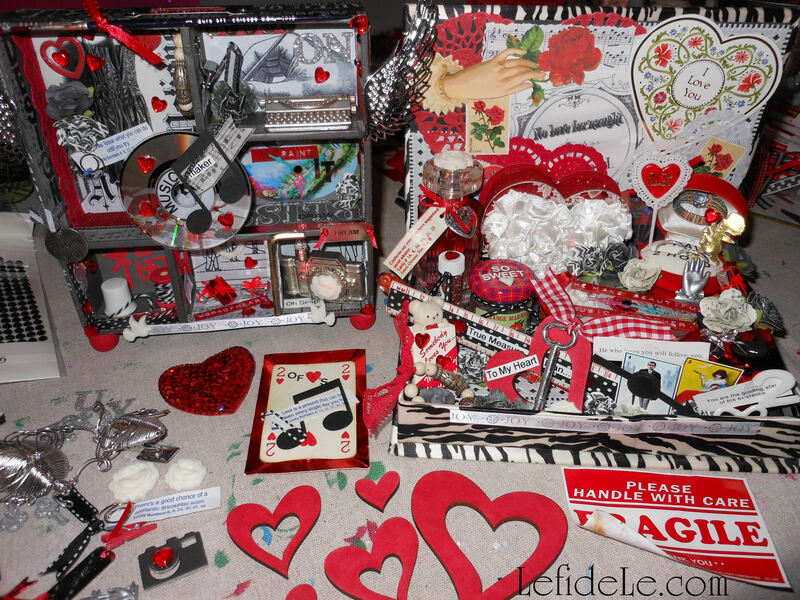 I ♥ Crafting… Don’t you?! 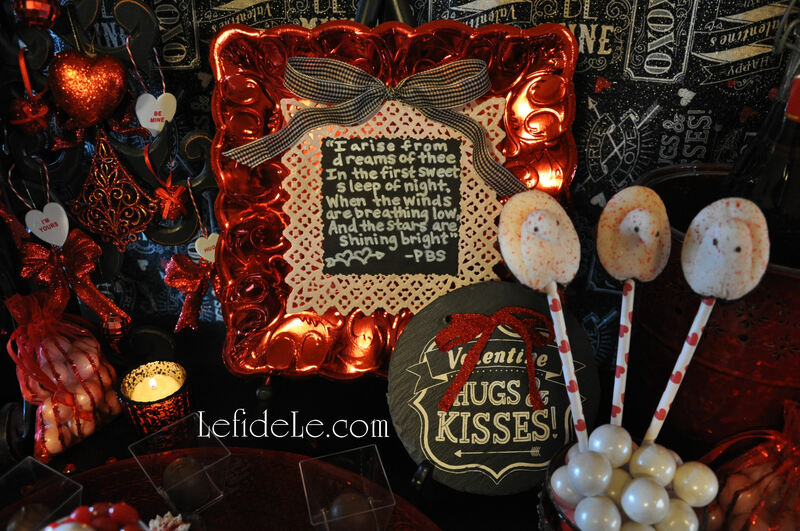 Running with the idea that opposites attract, I decided to make a Valentine’s Day Party theme that incorporated both matte black chalkboard and glittery red hearts. 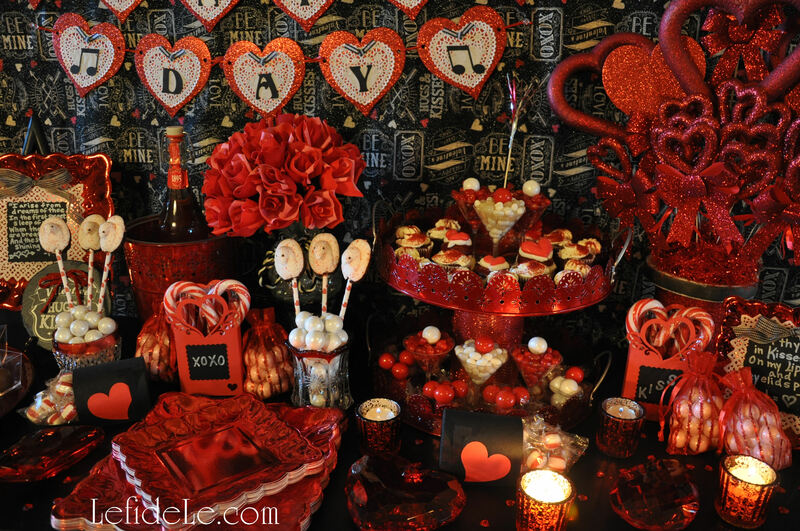 The elements actually coordinated beautifully for a party theme that would suit a variety of age groups, or even just serve as a surprise for that special someone. The whole shebang was actually quite inexpensive to pull off, though happily I believe that doesn’t appear to be the case. 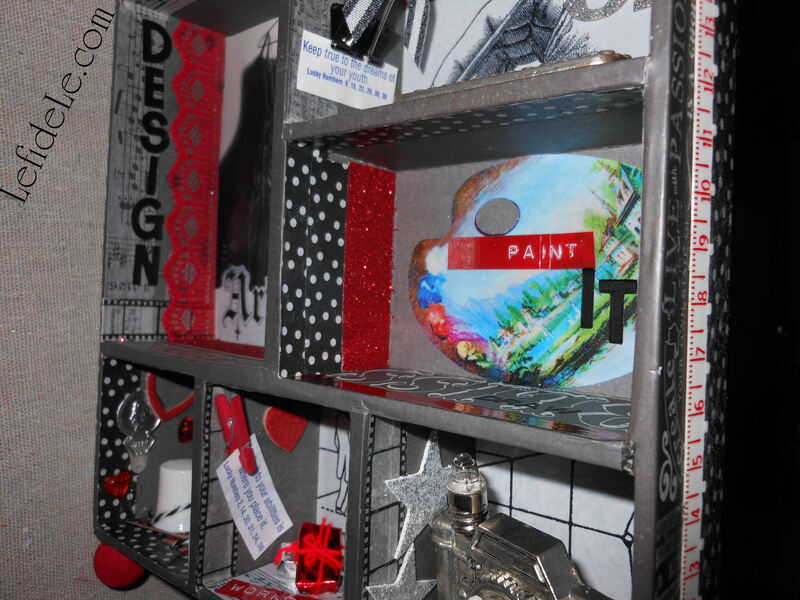 You can either follow the links to make the fast and easy crafts yourself, or go shopping with the theme in mind. 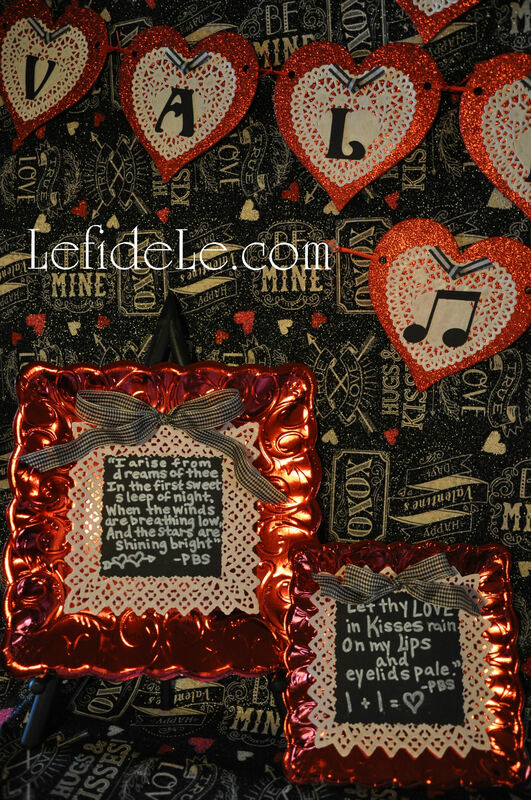 After deciding on my theme, I actually found this adorable chalkboard Valentine fabric that also had glitter hearts. (You can find some for yourself at Hancock Fabrics or Fabric.com using coupons from the affiliate links in the sidebar.) I hung this up with clear thumbtacks. I love incorporating ornament filled trees into holidays besides Christmas. 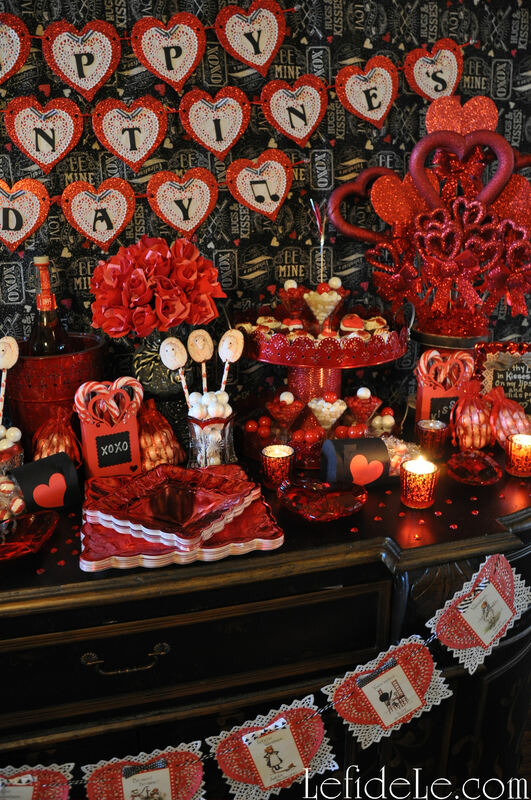 Valentine’s Day is especially easy to do this with because it falls so quickly after on the calendar so that one may really take advantage of all those deep after-Christmas clearance sales. Some of the baubles on this tree were marked 90% off which left the cost at mere cents. The topper is a glittered sprig of holiday pine. Some of you may recognize the black wooden tree from the Halloween Party. It looks really different when trimmed according to another theme. 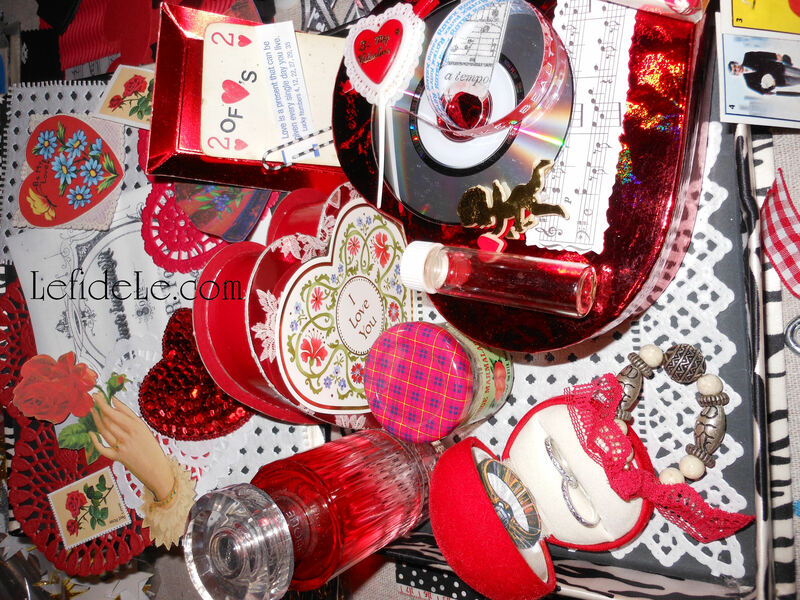 The conversation heart ornaments were made from white foam shapes (whose craft tutorial may be found here). I set all of these into a vase shaped like a thread spool twinned with glittery red flat yarn. 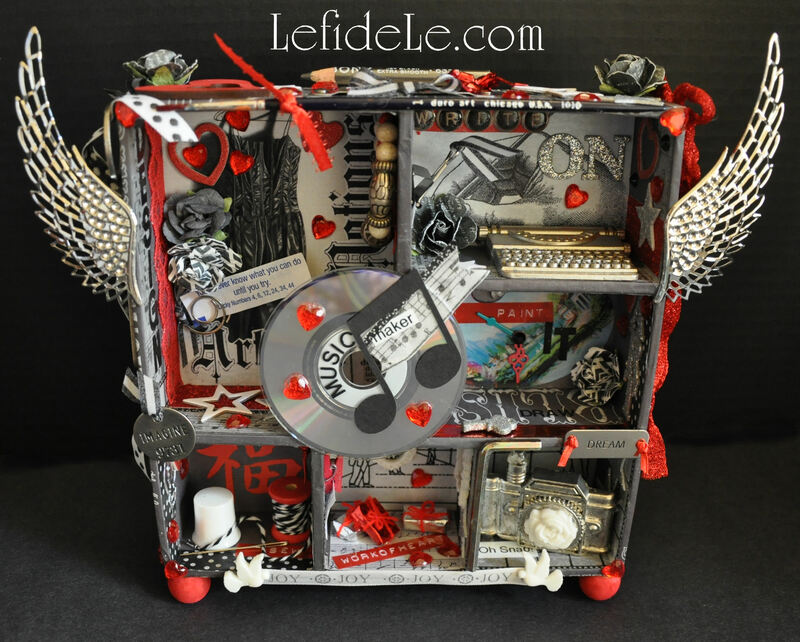 It symbolizes the ties the bind… and is filled with hearts. Glass marbles contain the arranged wands yet allow for easy removal. These are topped with another variety of glittery yarn to conceal the marbles. 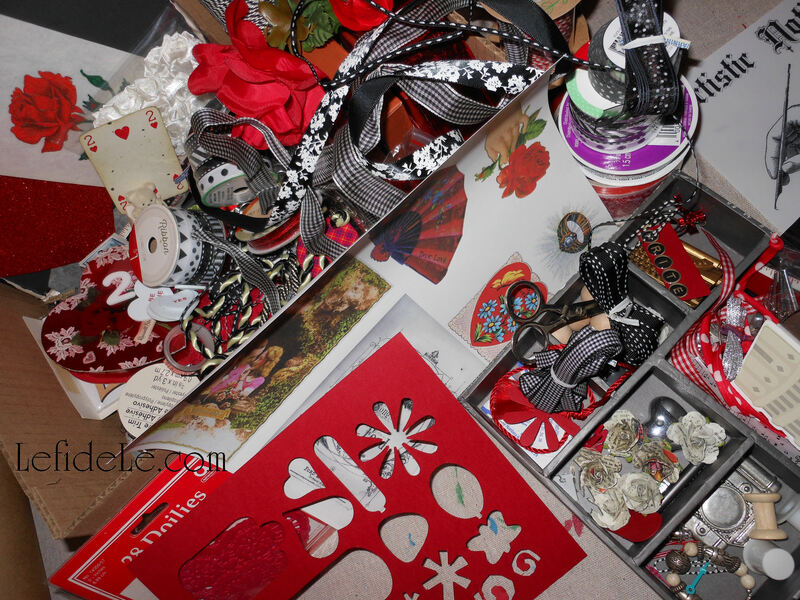 A variety of gift bags and boxes overflowing with candy were nestled into the ensemble. 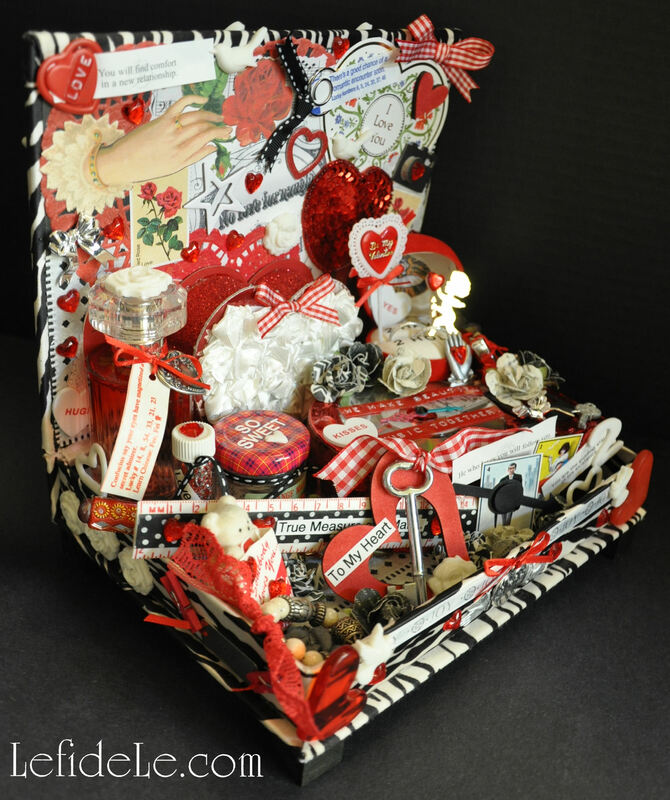 The heart bags and mail boxes were machine cut from construction paper. I included both oversized gems and tiny crystal hearts to fill in the empty spaces. I borrowed a bouquet of crepe paper roses that I had actually made for my mother years ago, and set these into a marble filled vase. 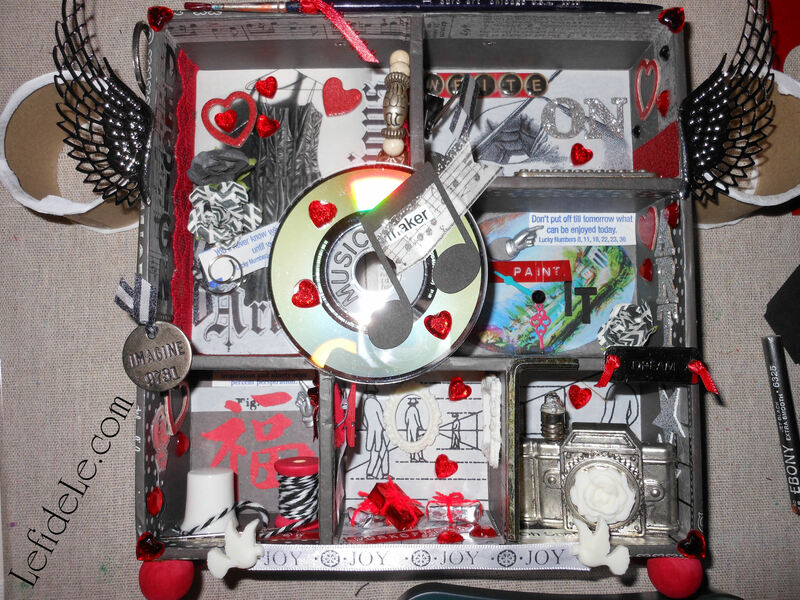 I wrapped it with some leftover rope trim that coordinated with the theme, and set it atop an upturned boxy metal vessel. 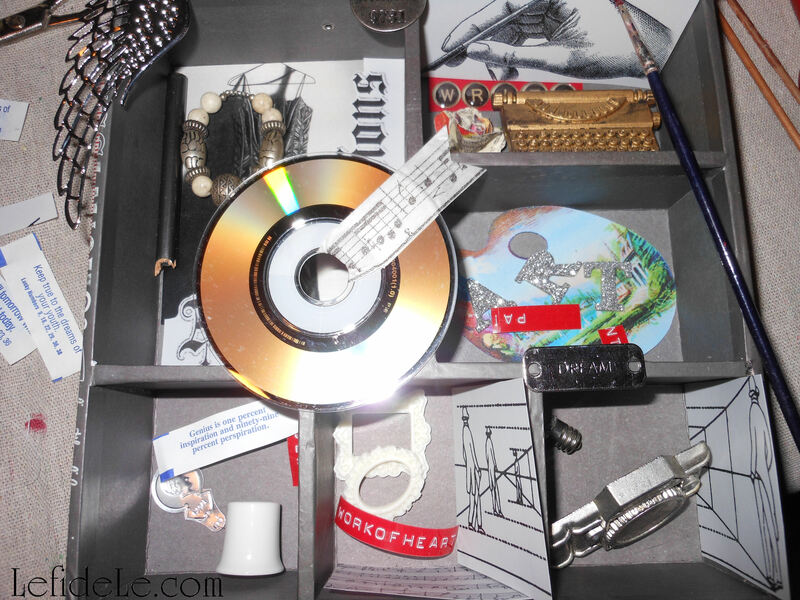 It’s really easy to create lifts and levels when one starts to think out-of-the-box and repurpose items for that other than which they were intended for. The treat tower is actually comprised of two metal trays that I found on after Christmas clearance years ago. I simply stacked these by using an empty drink mix container wrapped with glittery fabric. It was surprisingly stable, but you can add further assurance by hot gluing these for a temporary bond. A stronger adhesive would make the bond permanent. I stocked the tower with icing laden cookies, cupcakes, and candy cocktails. The other platter was another clearance gem from over a decade ago. It’s a lovely red metallic reverse painted glass. You can mimic this with a lovely red charger in either acrylic or glass. More of the same sweet treats topped the dish plus some delectable chocolate covered cherries set into their own treat cups. Try this with truffles or even upside down cake pops. 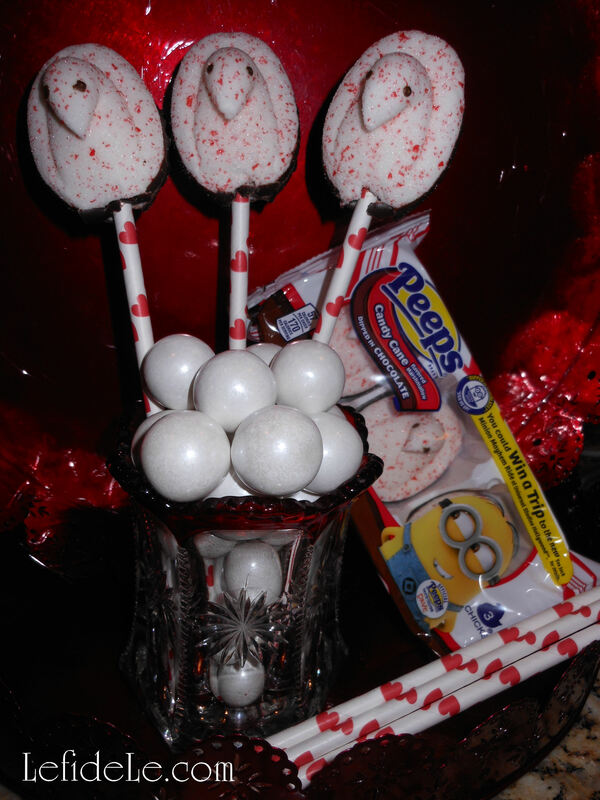 I made my own treat pops with Peeps red speckled white “love birds” with chocolate bases. To make your own, simply poke a pilot hole with a skewer or tooth pick then jab in a paper straw. I chose adorable heart covered ones, and then set these into gumball packed vintage crystal vessels. Any solid candy would serve as well. A non-alcoholic berry soda set into an ice bucket serves as equal-opportunity refreshment. The same red metallic plates that appear in the chalkboard sign crafts were placed front and center. 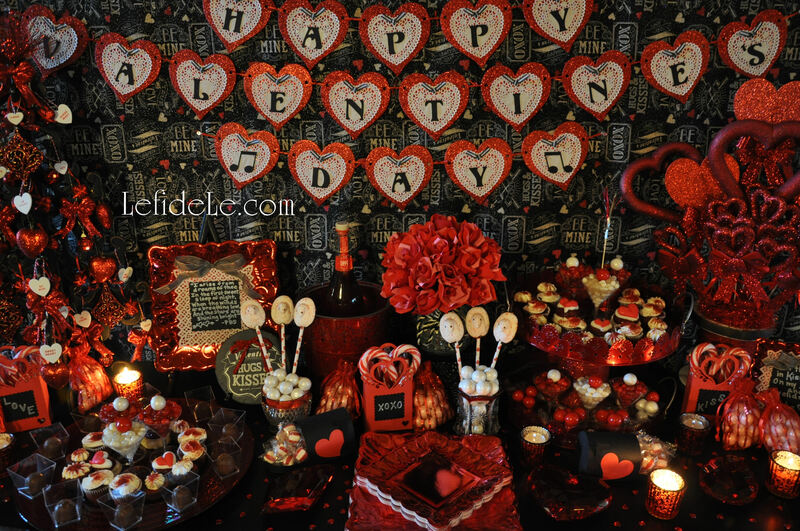 Last but not least to complete the sweet buffet was the addition of candlelight. (Use LEDs if you fear sleeves catching fire or if you have young guests attending.) Red mercury glass votives were, you guessed it, purchased for mere cents post-Christmas. They really added to the ambiance of the whole setting. 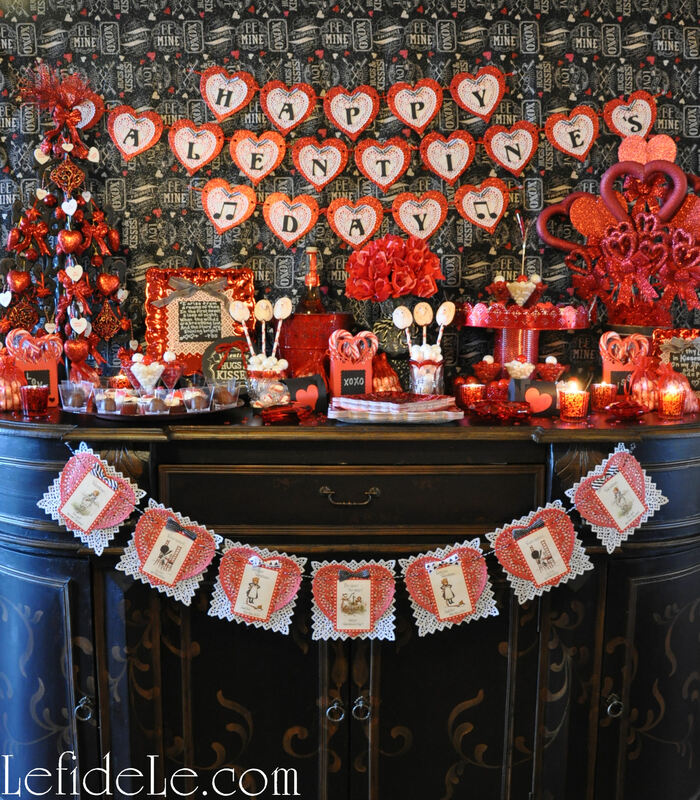 This mélange of fast and easy crafts were made to decorate a Valentine’s Day Party, but you can adapt them for any purpose you like. 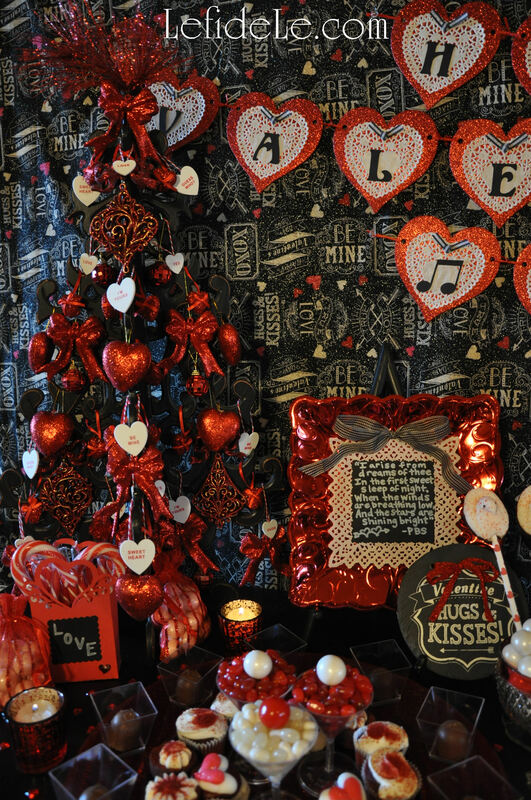 The faux chalkboard craft is an inexpensive way to decorate for the holiday, but also makes a quick Valentine for a love one. 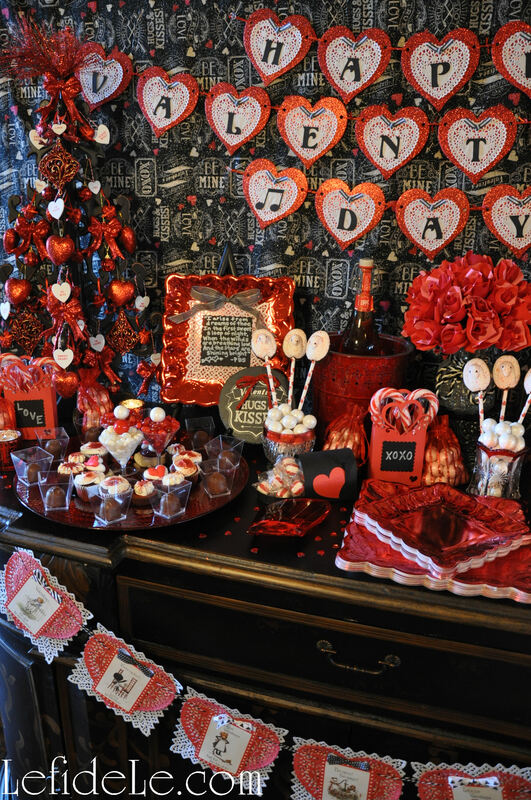 The chalkboard idea can also be extended to other favors quite easily. 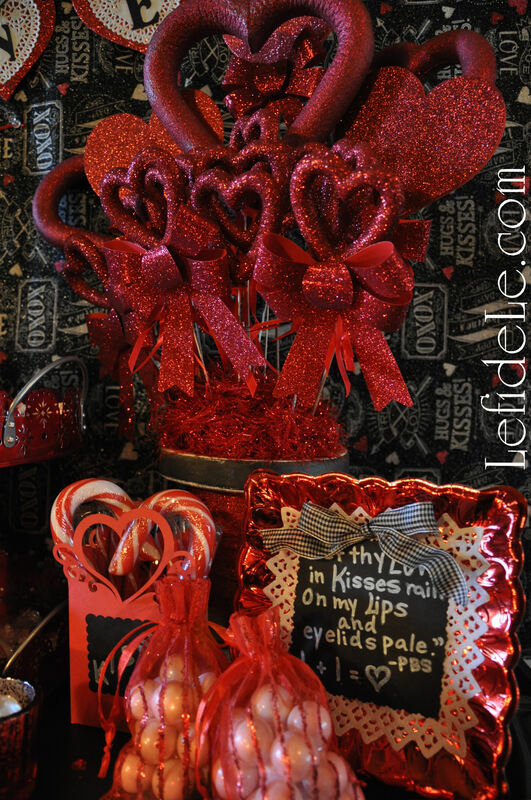 The glitter heart wands effortlessly gather into a dramatic centerpiece, and can be taken home as favors by each Valentine princess at the party. 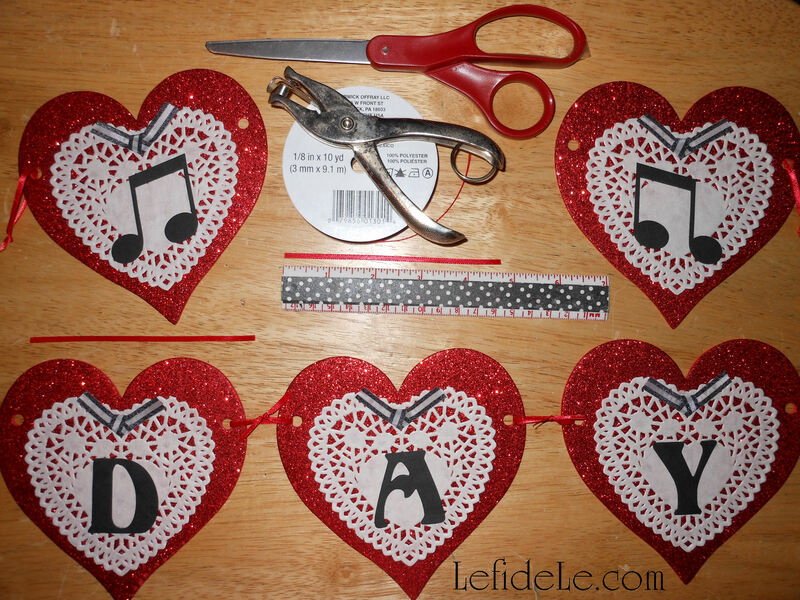 (Make these with foam hearts or my free printable from the Valentine’s Day banner craft.) 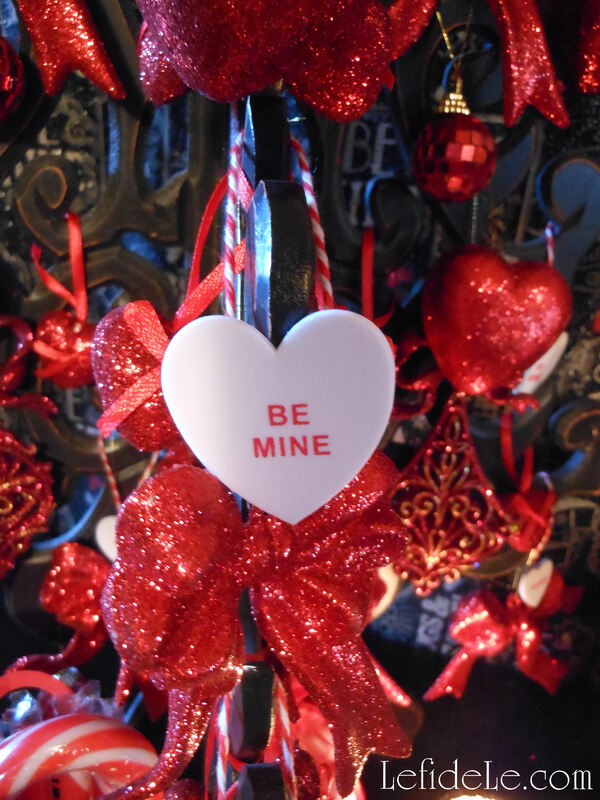 Also, make Valentine ornaments with the kiddos in your life using foam Conversation hearts in a matter of minutes. 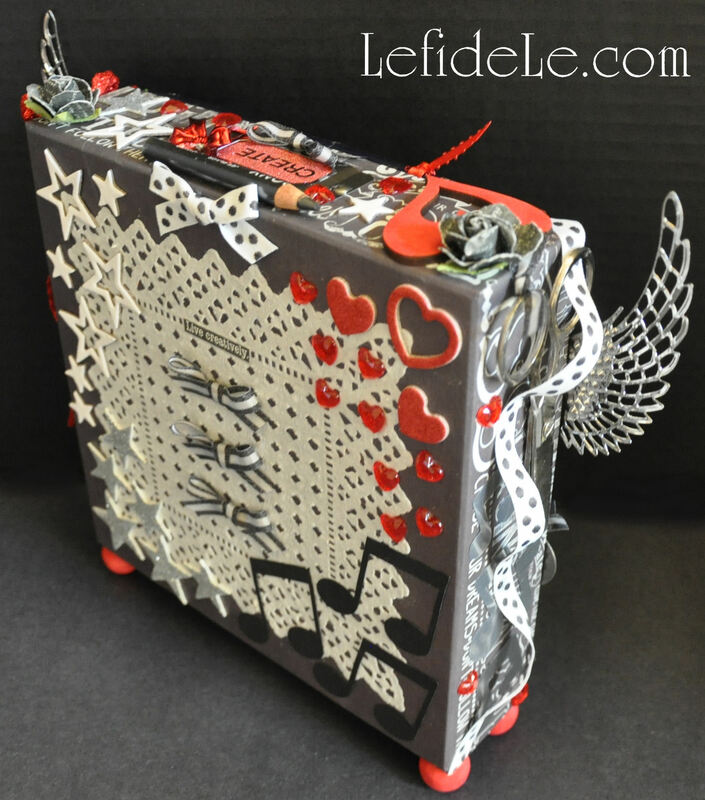 You can either glue the hearts back to back, sandwiching twine or thin ribbon between them, or simply tape twine loops to the heart backs. The latter is the quickest way to make them, and the easiest for a little one to help with. 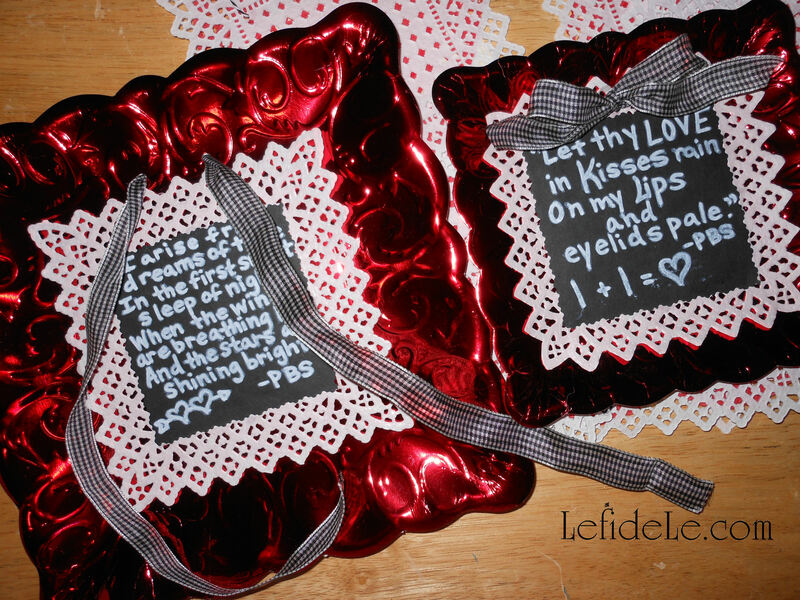 The next project is a faux chalkboard sign, that also makes an inexpensive Valentine, using the unexpected material of a paper party plate. 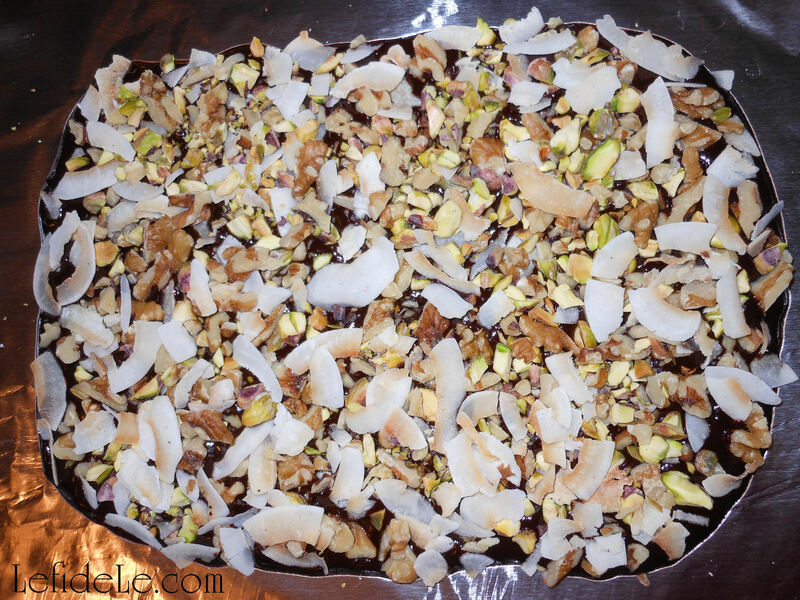 The square metallic disposable plates are lovely yet extremely budget friendly. 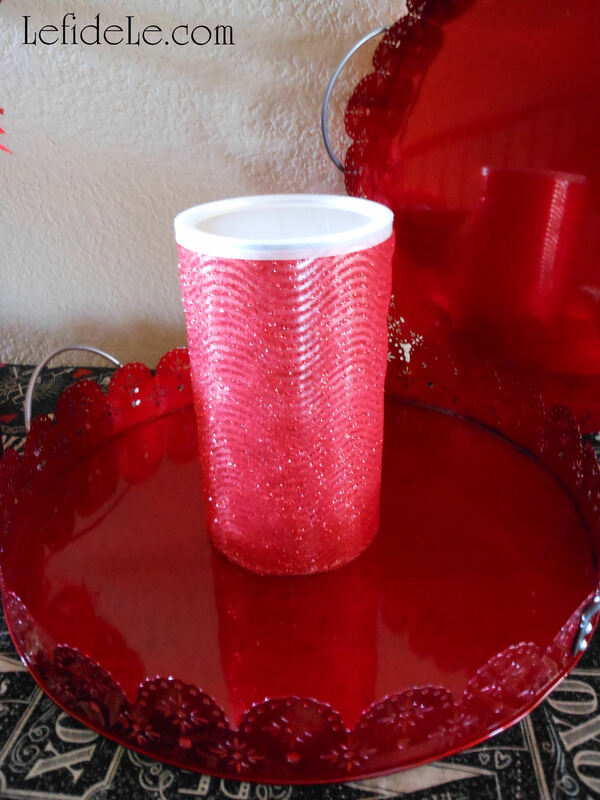 Why not pick some up for the party and reserve one or two to fill in as décor. 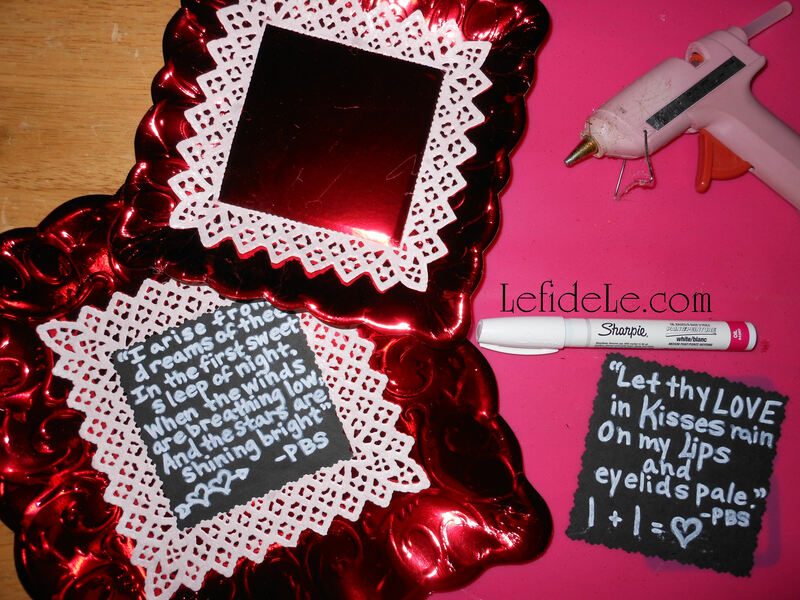 Merely use dots of glue to layer square doilies onto the plates. 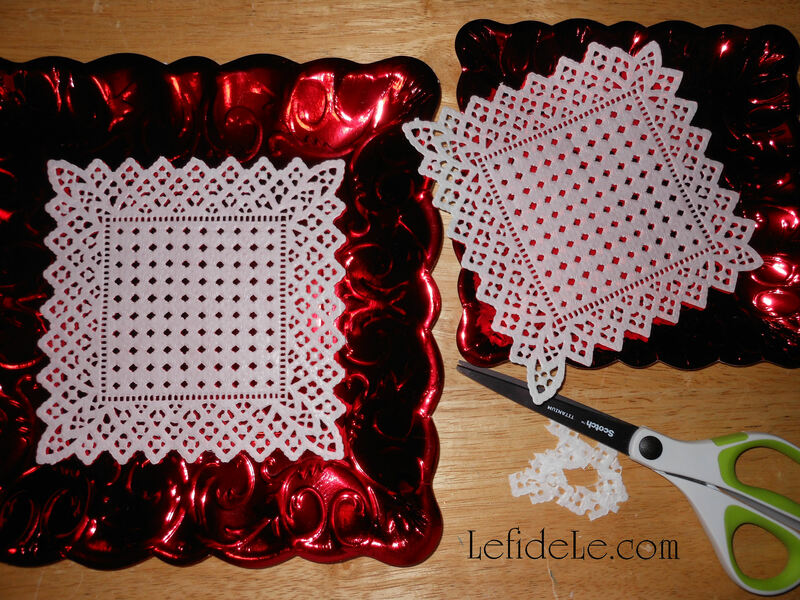 Simply trim down the doilies to fit the smaller plate sizes. 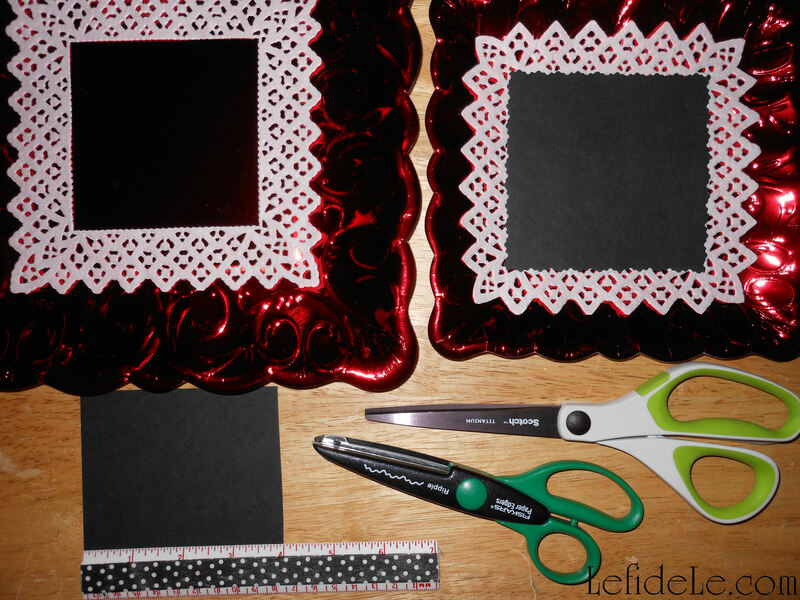 Then cut a square of matte black cardstock to size, and glue atop the doily. Use a white paint marker to write whichever sentiment, poem, or quote you wish. Use a hole-punch to add 2 openings with which to slip a strand of coordinating ribbon through. Simply tie the two ends in a bow, which also serves to further decorate the sign. Similarly, cut squares of black cardstock to adorn gift bags and boxes, using the same white paint marker to write your sentiment in “chalk”. If the writing doesn’t seem clear enough, simply go over the letters until they do. The uneven edges make them look even more like chalk, but won’t come off on your clothing while delivering them to your recipient. 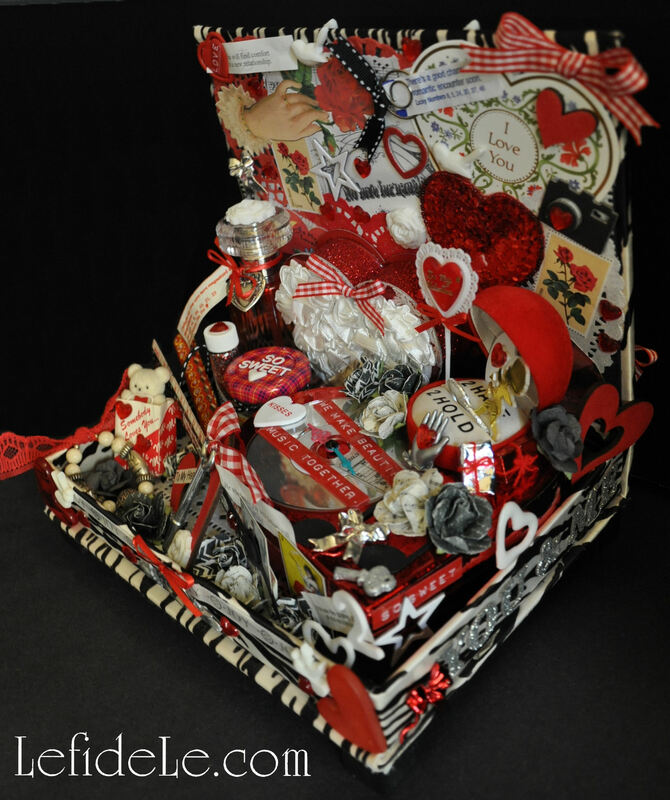 The last project is a centerpiece of glittery hearts meant to be taken home as party favors at the end of an event. You can even print, cut, and glue these onto tiny wooden dowels using my free printable at the end of the article. 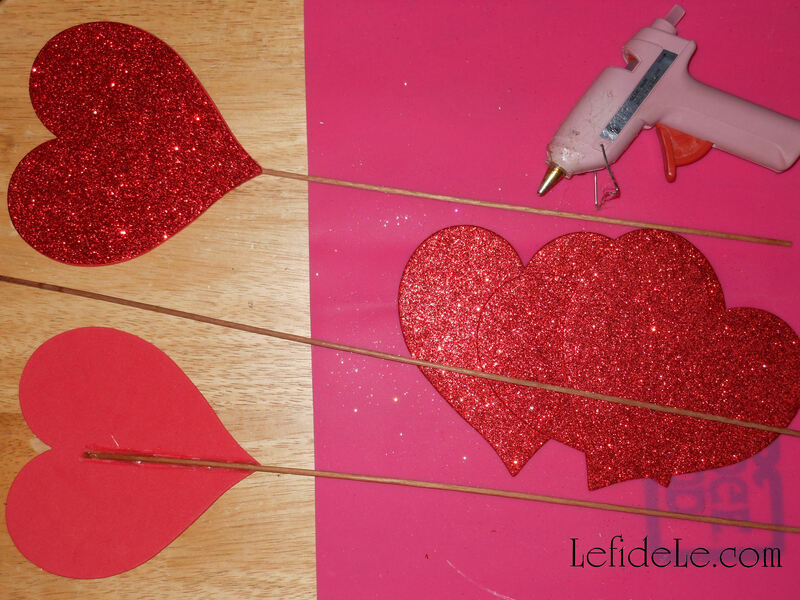 I sandwiched a thin dowel between 2 glittered foam hearts with the aid of hot glue. The thinnest dowels are really easy to just snap in half where you want to section them. 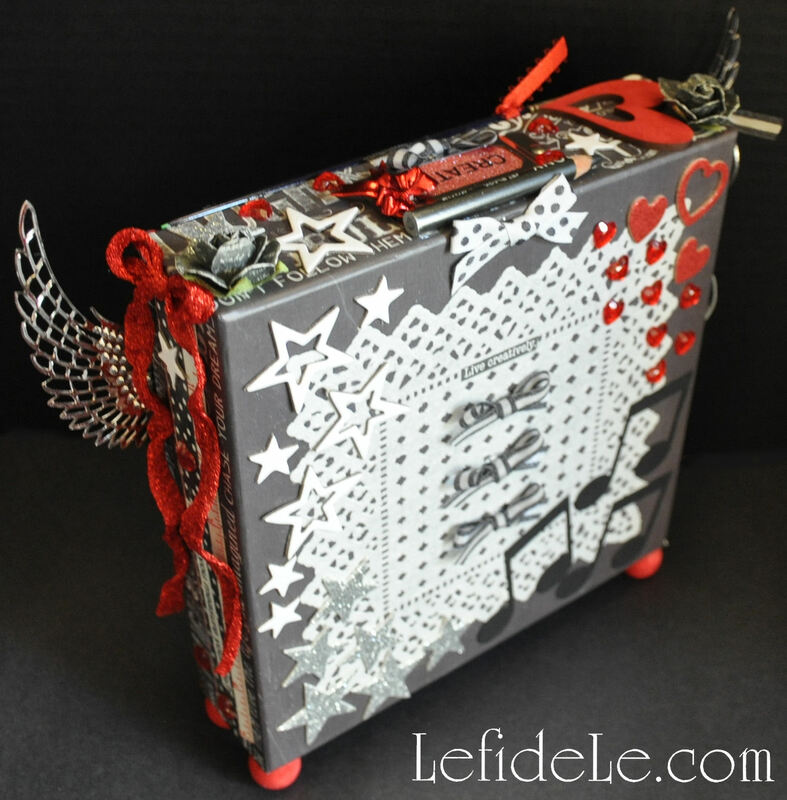 Trim with a bow of glitzy ribbon if you like. I used readymade glittered bows from an after Christmas clearance sale. 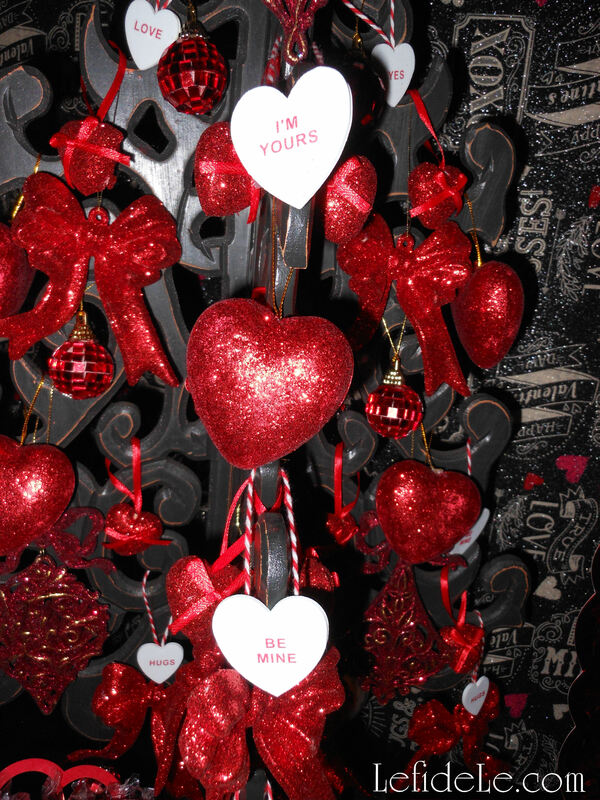 The open hearts were made from inexpensive styrofoam and red glitter blast spray. For the largest ones, I simply jabbed in a cut section of wire hanger as a handle, but a thin dowel would be better if gifting them. 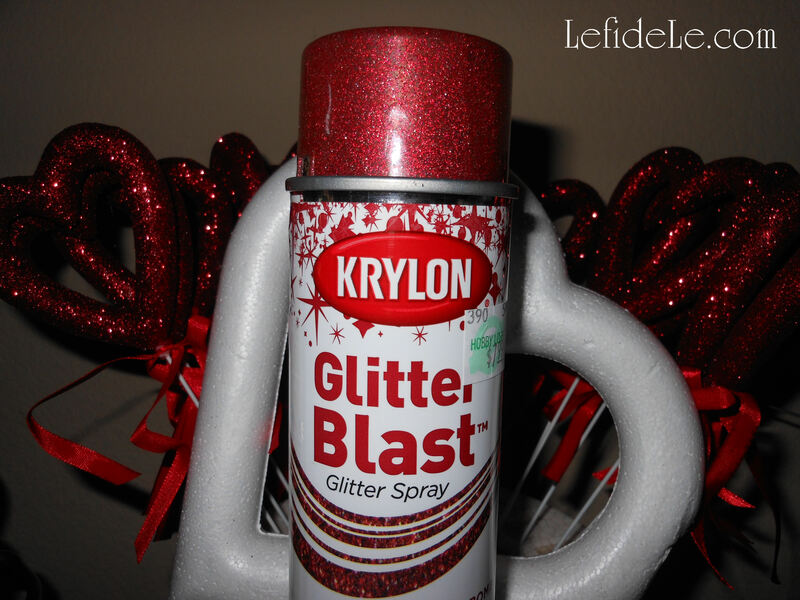 I added glittery bows to some of these as well. All of them will sit securely arranged in a vase filled with marbles. This way they can be easily pulled out one by one at the end of the celebration as favors. I just pilled on an unraveled skein of glittery red yarn atop the marbles to hide them. P.S. 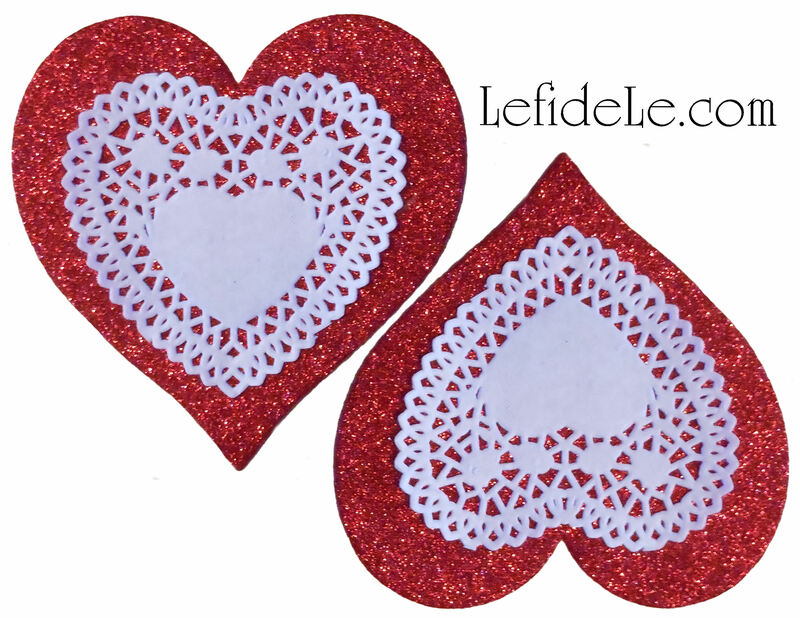 Here is the Glitter-Doily Heart Printable. Simply right click on the image and select Print. Print them in the best color photo setting. 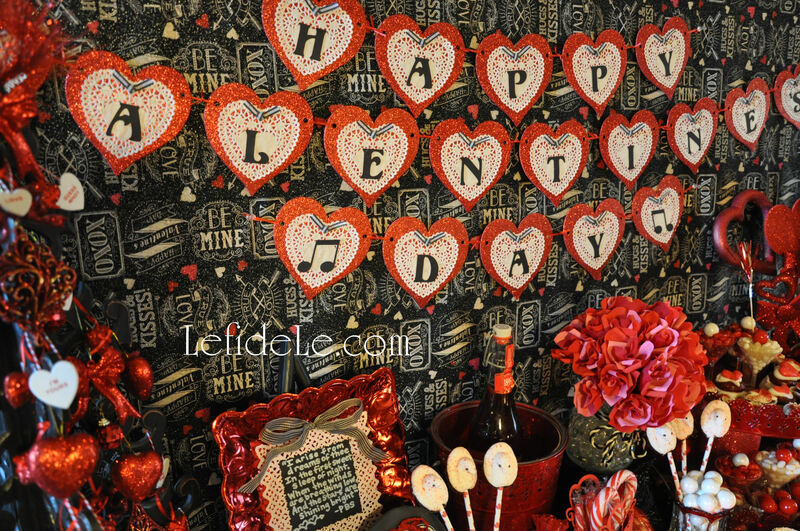 These Valentine’s Day banner crafts are so fast and easy that even the busiest mama can make them with her little ones. 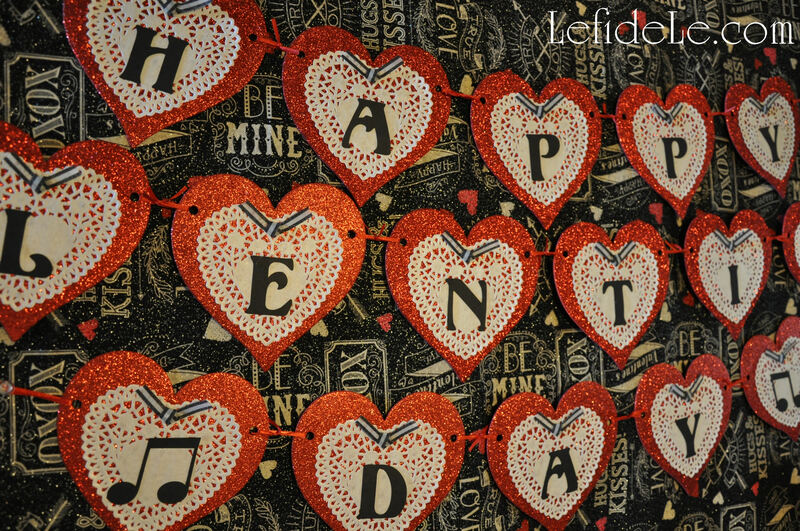 The glitter heart and doily printable only needs the addition of letters to spell out any message you wish. 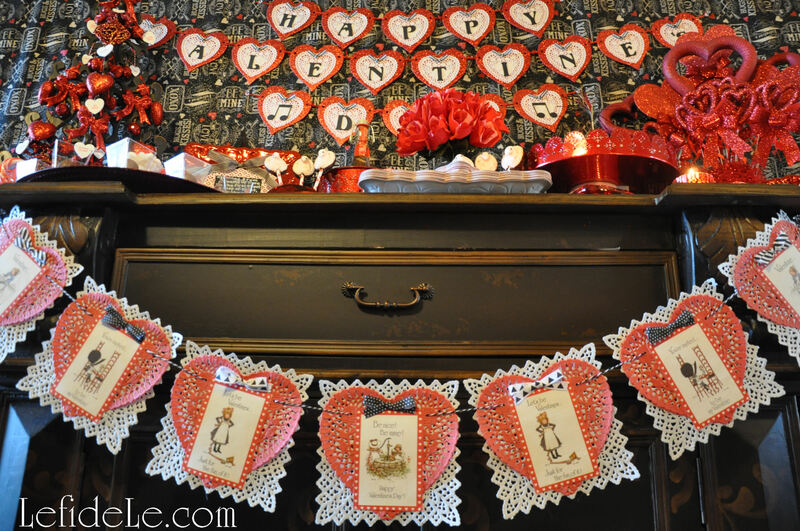 The second banner is comprised of layered doilies and extra valentines. 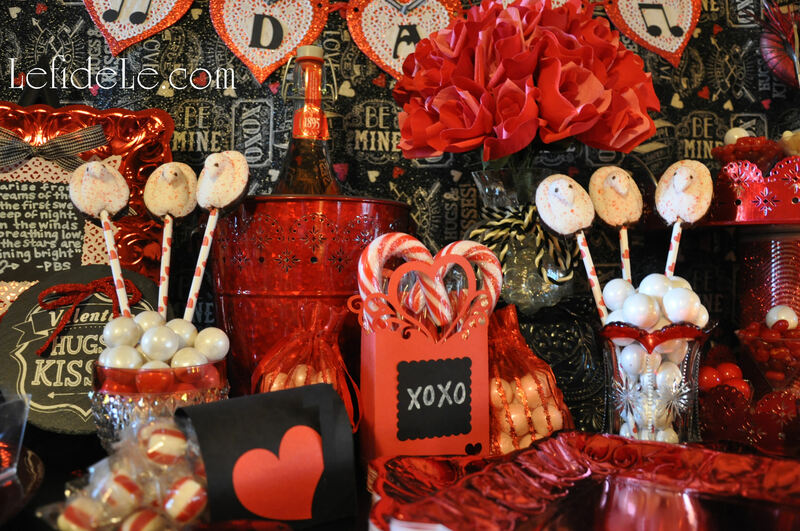 Both are so inexpensive yet add a lot of heartfelt sentiment and party atmosphere. Plus, they’re lightweight enough to stick in a big envelope and send to a loved one whose away for the holiday. 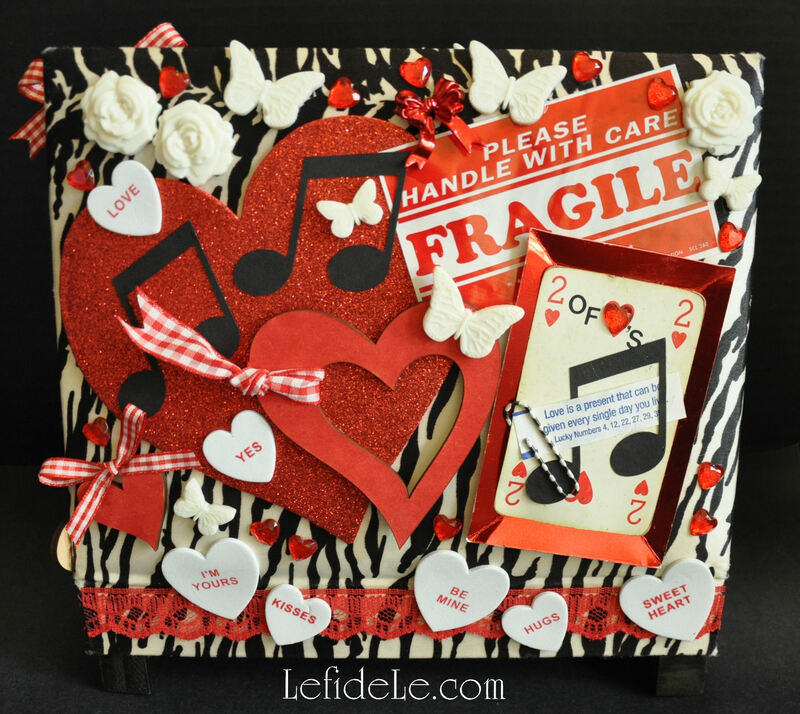 You can even use the printables as stand-alone Valentine Cards! 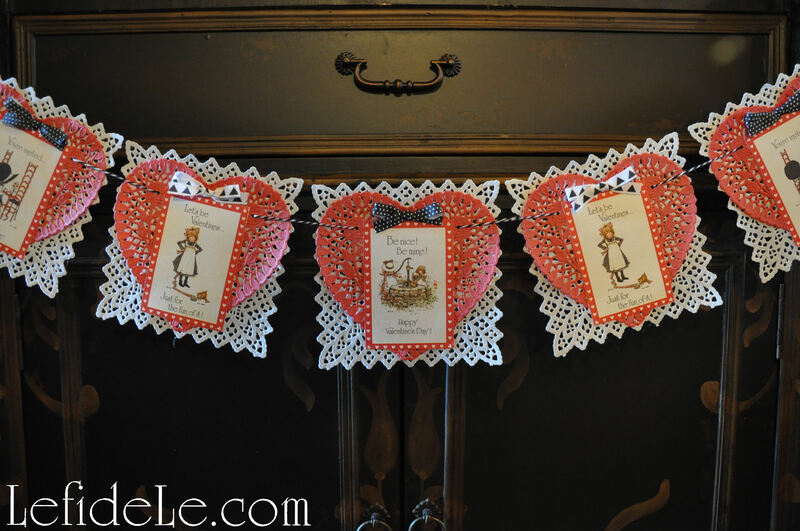 First let’s make the doily valentine banner. 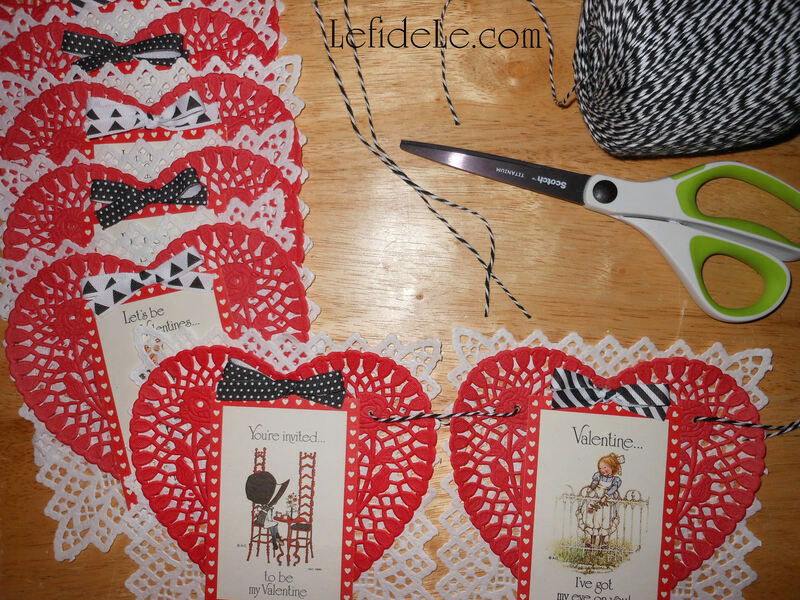 This is a great project to use up any leftover schoolroom Valentine cards from your kiddo’s class. You can even save the received ones to make banners for next year’s celebration. 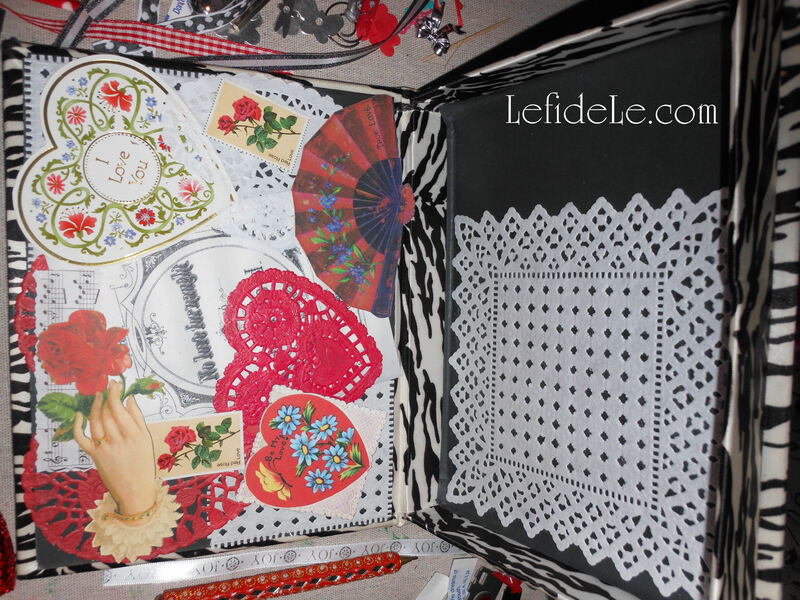 One only needs to add some low-cost paper doilies in varying sizes. 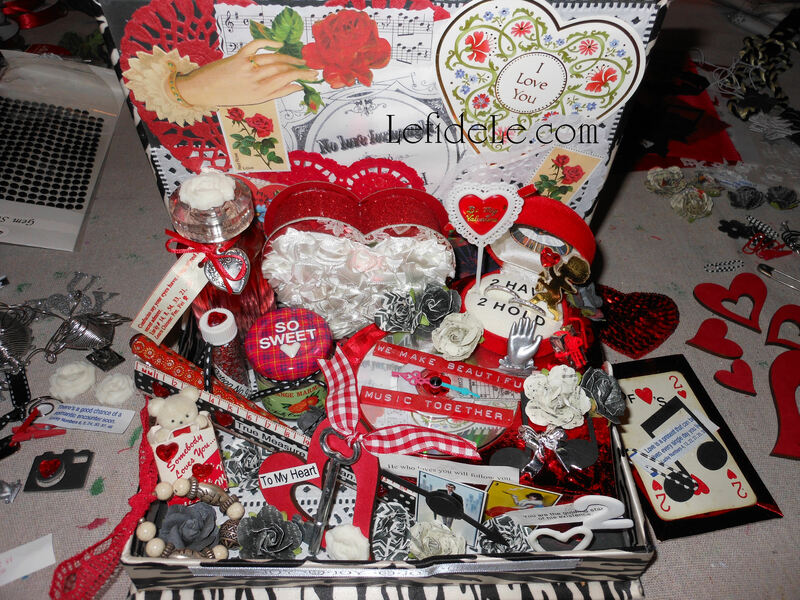 I used leftovers from last year along with some Holly-Hobby Valentine Cards from my childhood. 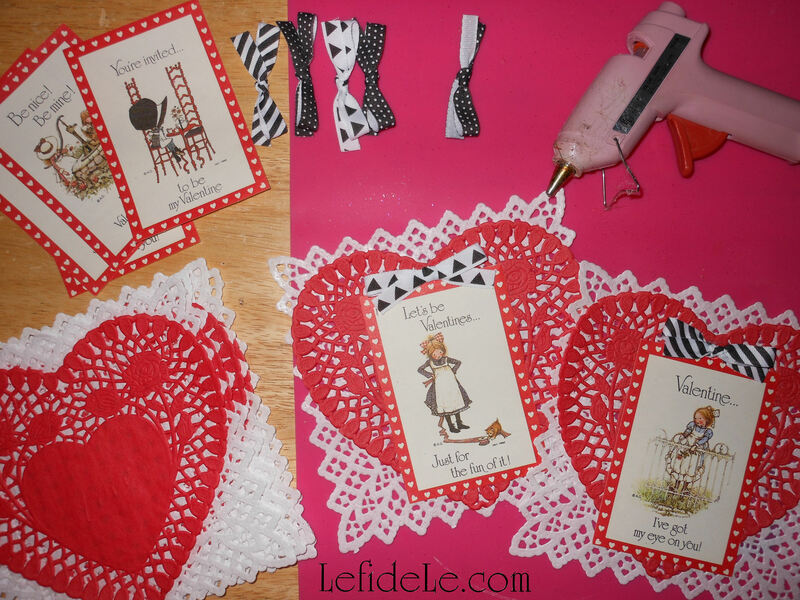 Merely use dots of glue to layer the doilies and Valentines. Then add a ribbon bow for dimension. Tie circles of twine, yarn, or ribbon through the holes in the doilies and knot together. Hang it up and enjoy! 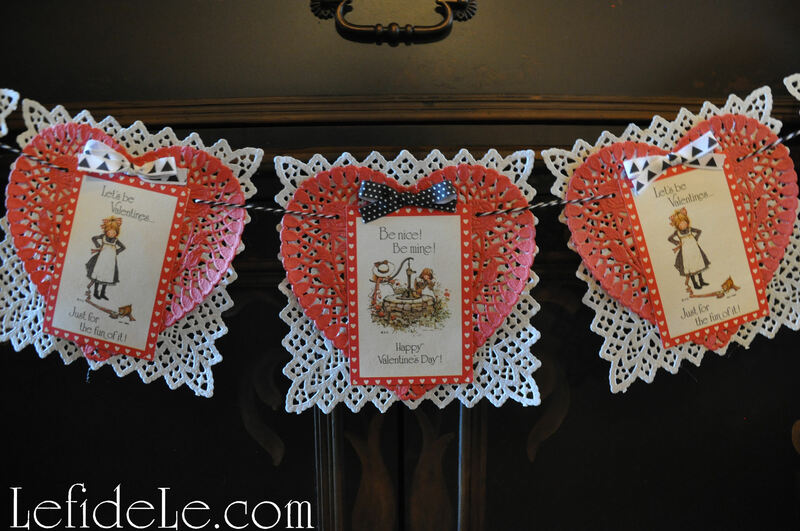 The glitter heart and doily banner is one that can be easily made by two different methods. 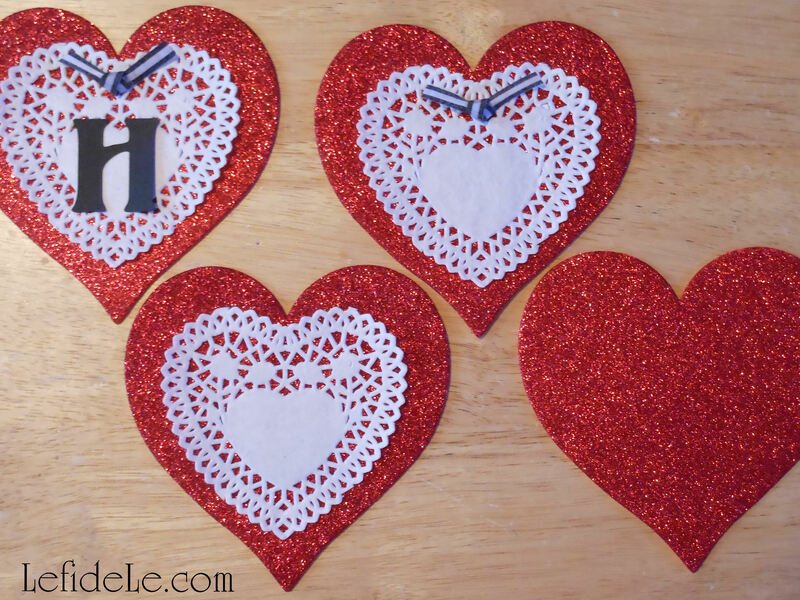 You can print and cut out all the glitter doily hearts you need, using my printable at the end of the article. 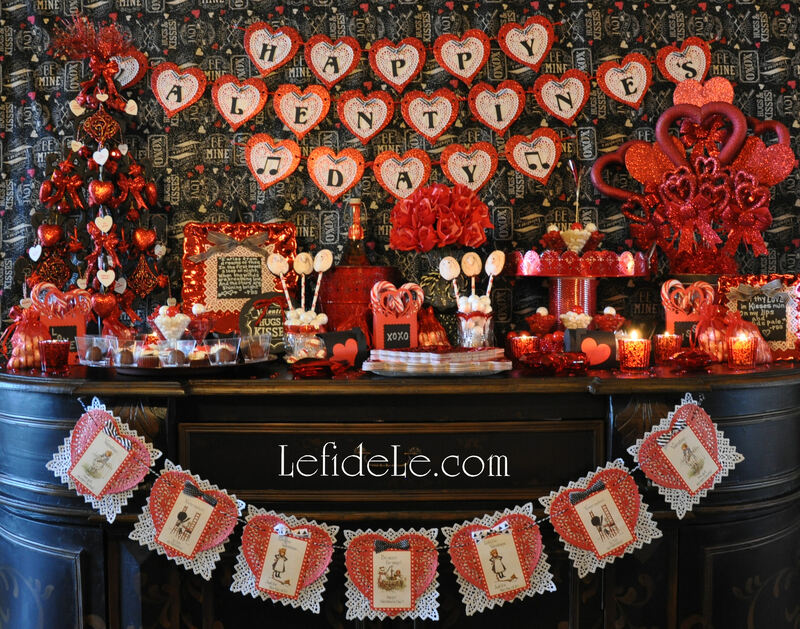 You can also use inexpensive glittered foam hearts from the craft store, and use hot glue to layer white doily hearts onto them. 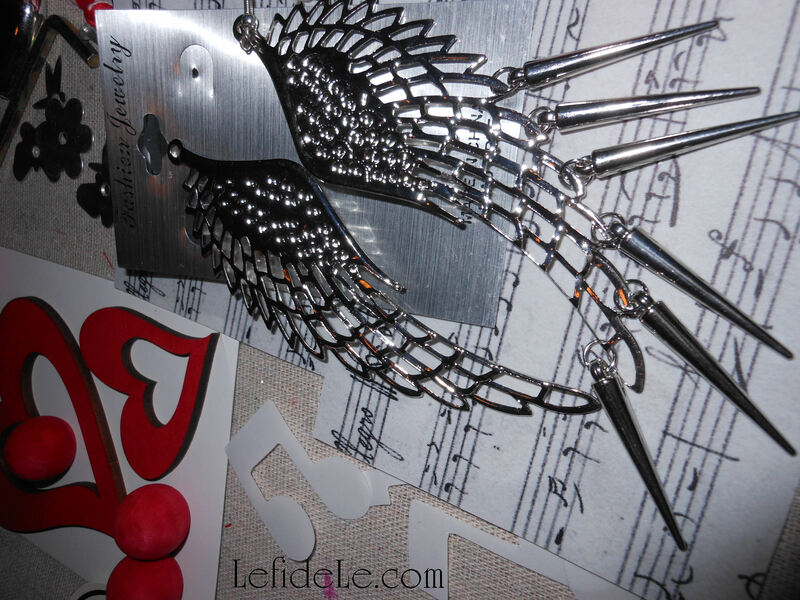 Next add holes to both sides of each heart with a hole-punch. 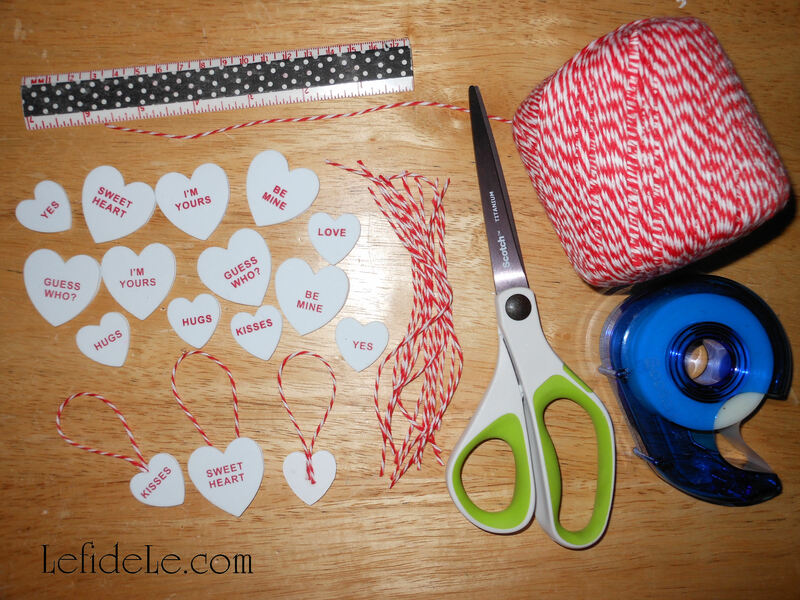 Then use ribbon or twine to string them together. Add a loop at each end to hang the banners by. Voila! 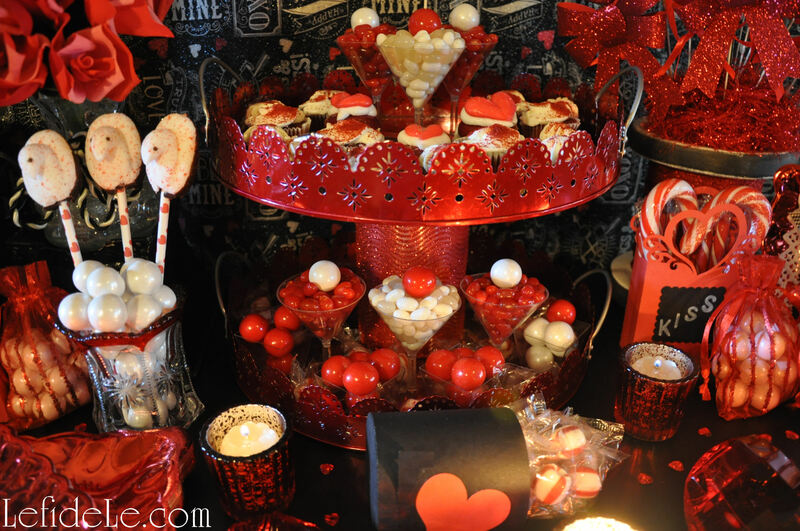 If you’re looking to make some sweets for your sweetheart but haven’t got a lot a time to get organized for a complicated recipe, then these Valentine concoctions are a sure bet. 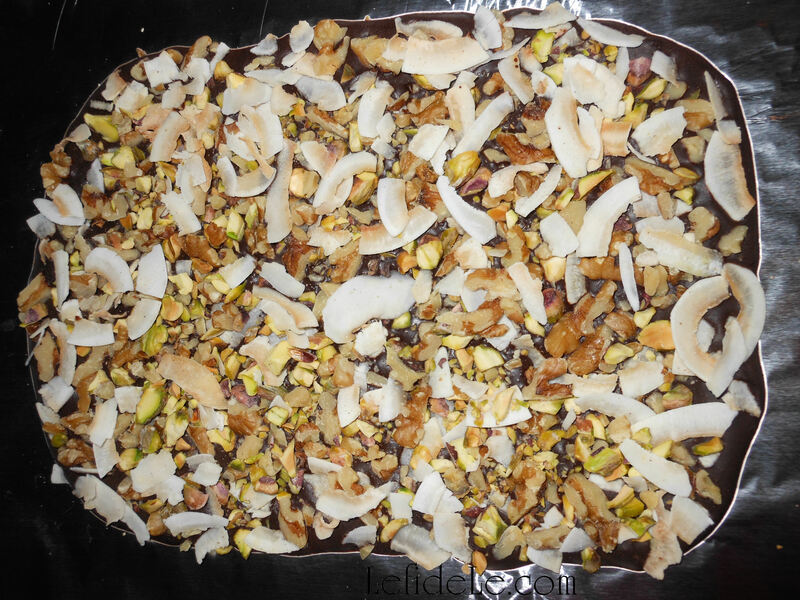 The fool-proof process is so quick and easy, that it really needs no hard-fast formula in order to turn out so delicioso! 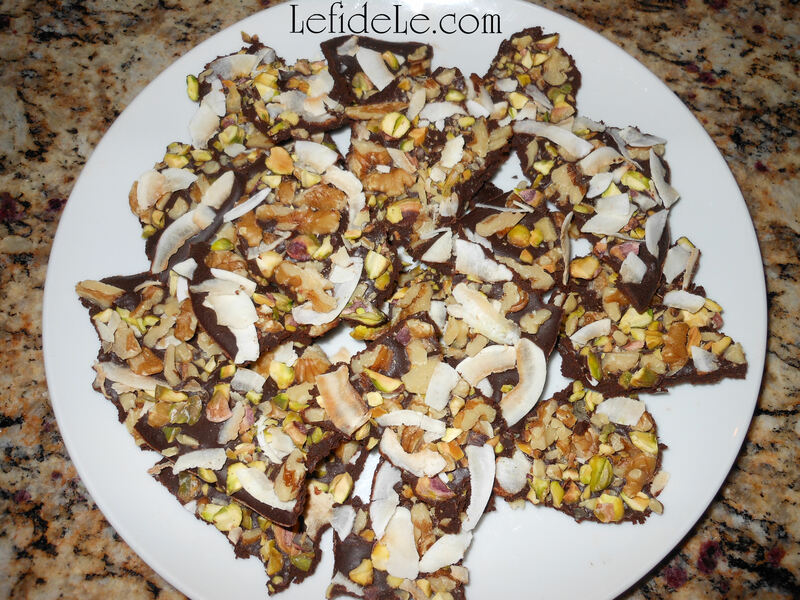 I tend to make both of the confections at the same time because they use identical shelf-stable ingredients (save one), but make two very different desserts that coordinate beautifully. 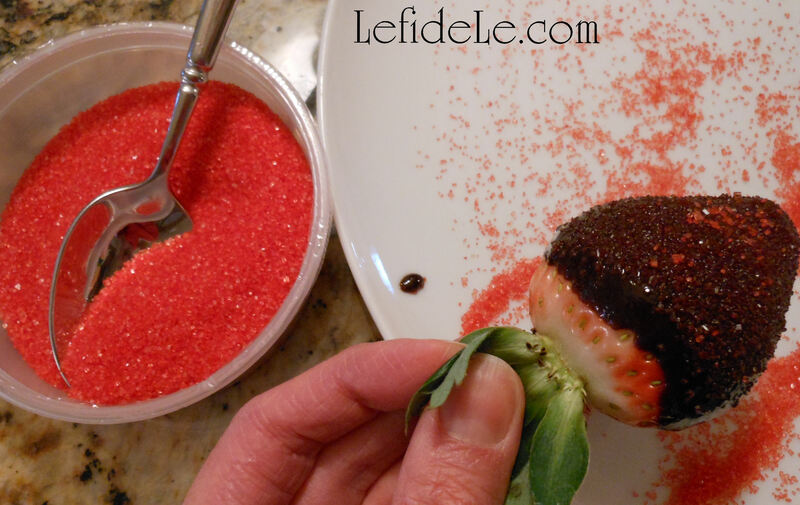 (If trying this, simply make the strawberries first then make bark out of the leftover ingredients.) Best of all, these are simple enough to be prepared by little ones, and can be made gluten-free and allergy-friendly for everyone to enjoy! 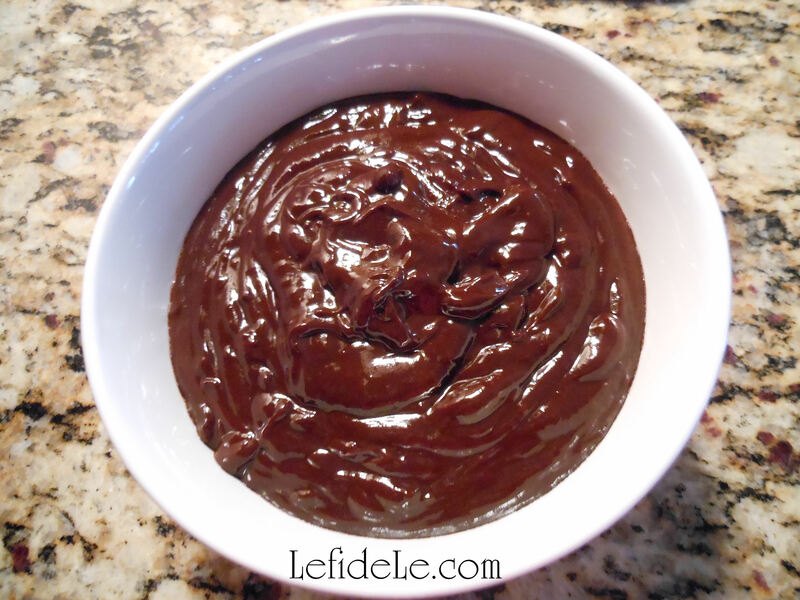 Either stir the chips in a pot on the stove (as I did at this link for Quick & Easy Chocolate Coconut Fondue Recipe (Vegan, Gluten-Free, Dairy-Free) where I write more about the available forms of chocolate) or microwave the chips in a bowl in 30 second bursts, stirring in between each. I used the stove for the fondue and the microwave for the bark… again it’s up to you and how much time you have. When the chips are completely melted to a liquid state, pour onto an aluminum lined cookie sheet. 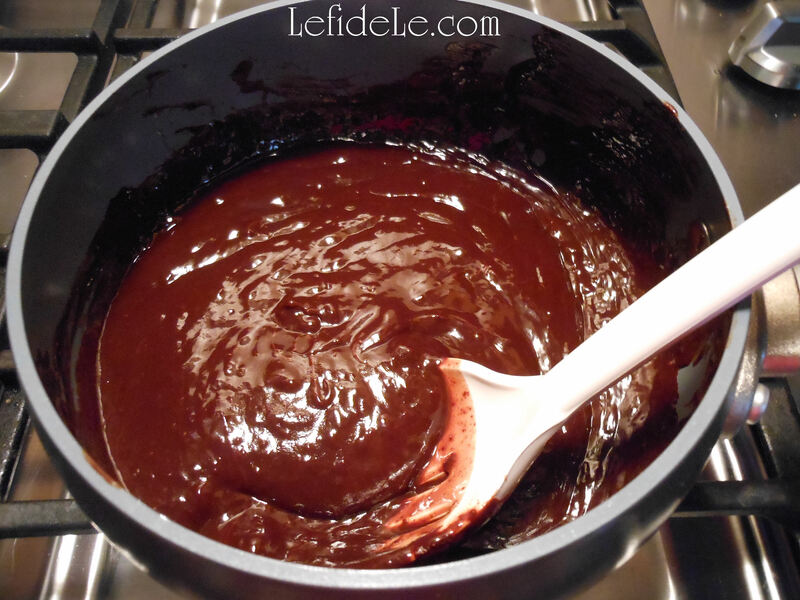 Sprinkle your choice of toppings onto the still warm chocolate. 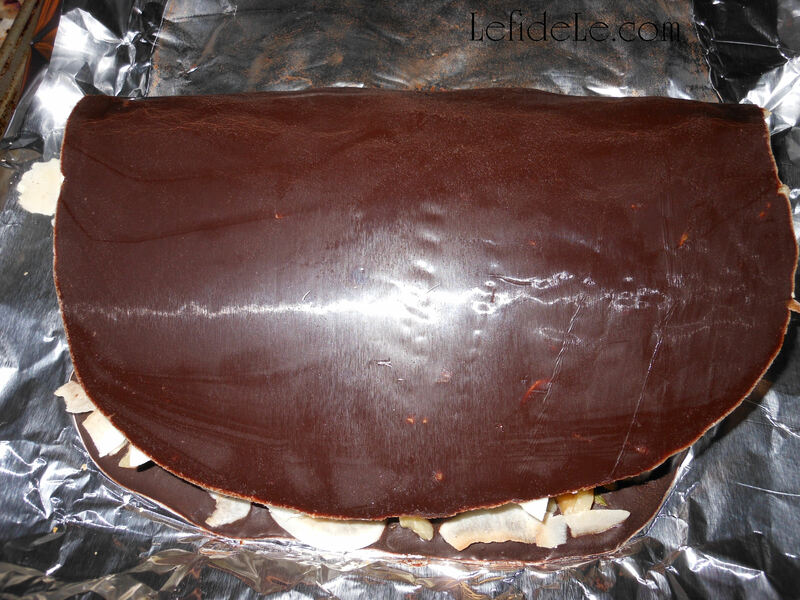 Gently press the larger toppings like coconut into the chocolate with the back of your fingers. (Smaller bits like sprinkles don’t need any pressing.) Either allow this to harden on the counter or in the refrigerator. This is the fun part… when it’s solid to the touch, take one end and break it by attempting to fold it in half. Repeat this with all sections until you’re left with decent sized chunks of yumminess then plate it for company… after reserving a few bites for immediate consumption! 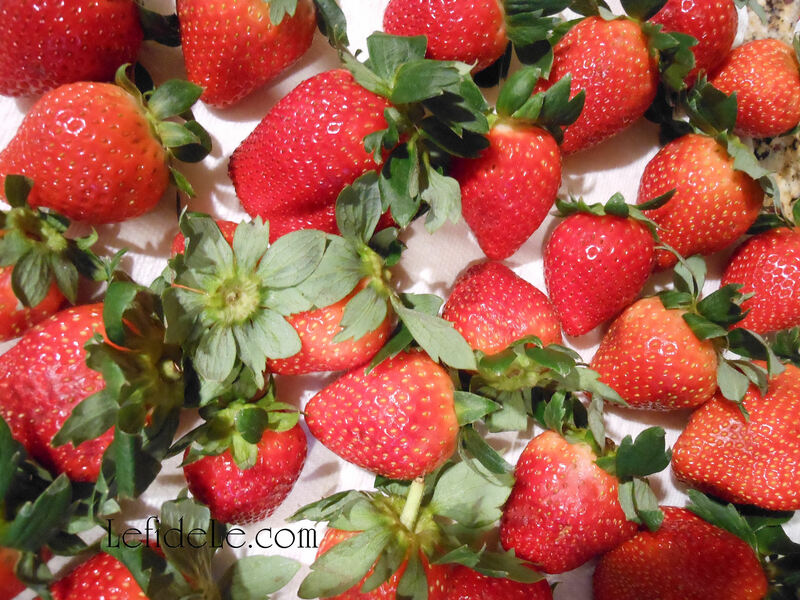 Wash the strawberries well, then let them air dry on a paper towel, or pat them dry completely before dipping. 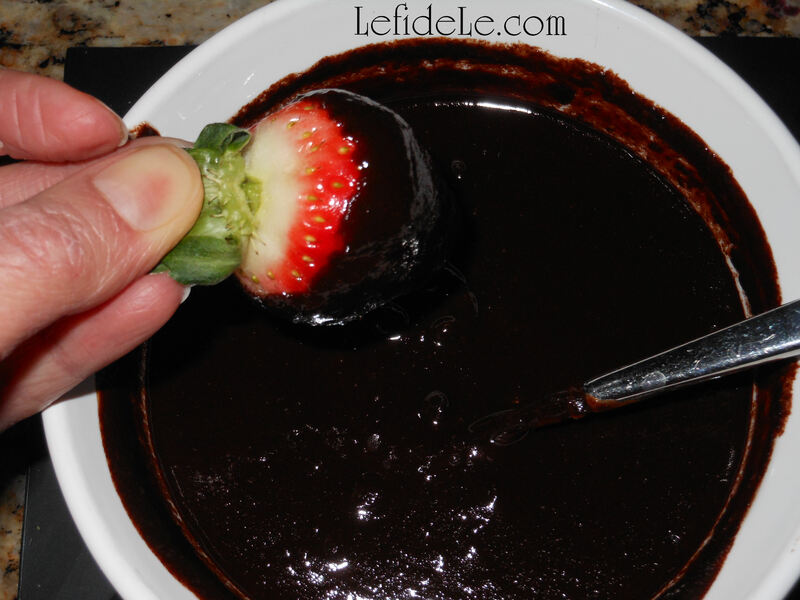 When the chips are melted thoroughly with no chucky bits left, merely hold your strawberries by the green tops and dip into the chocolate. After completely enrobing it, turn the wrist to let the last drip catch back onto the fruit. 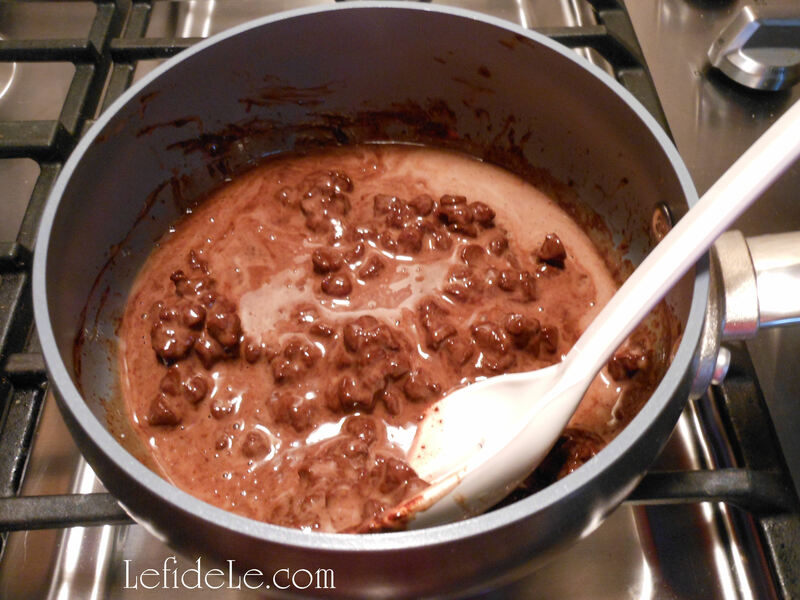 Then spoon chopped toppings or sprinkles over the still warm chocolate. 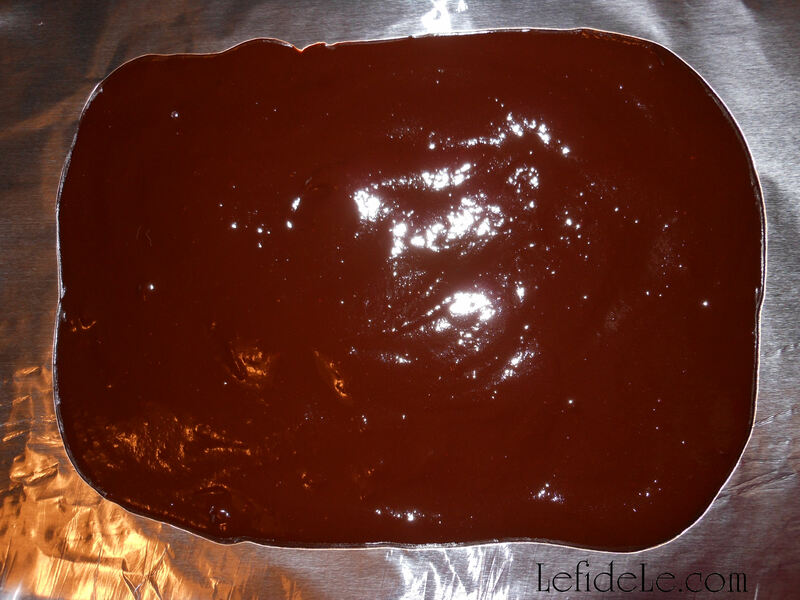 Gently press any large chunks into place, and then set it aside to dry and harden. 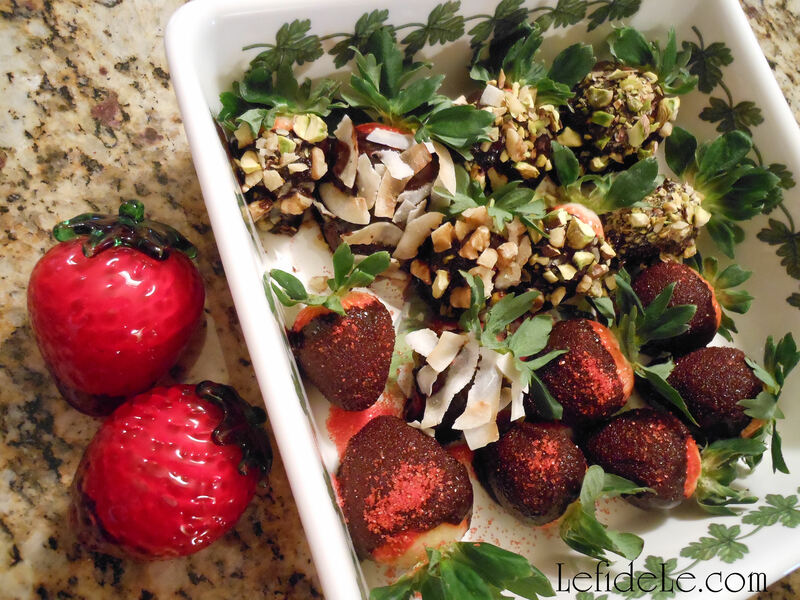 You can either place the completed strawberries onto aluminum foil and transfer them to a pretty plate later, or do as I’ve done and save a step by dishing them immediately to dry on the platter they will be served on. 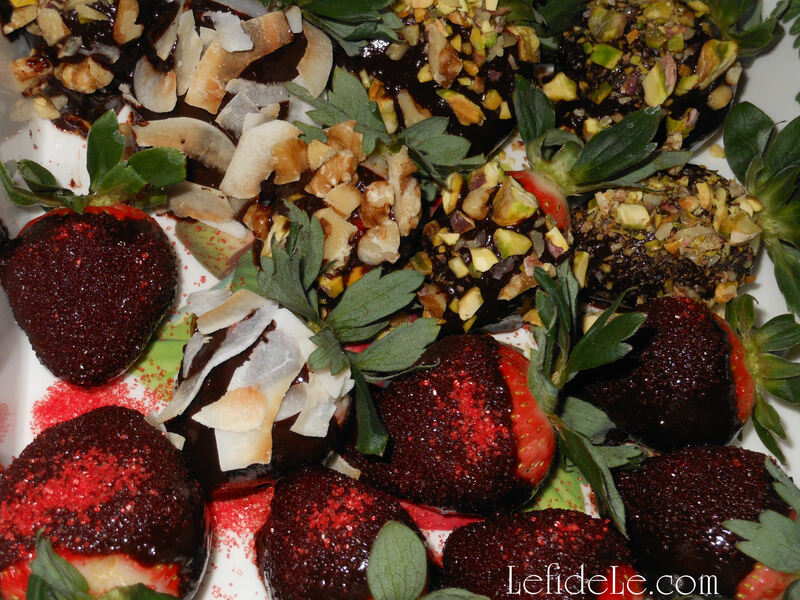 I always begin with the prettiest of the berries, and when I find that the platter is full… eat the rest! 🙂 Happy Chocolate err… Valentine’s Day!